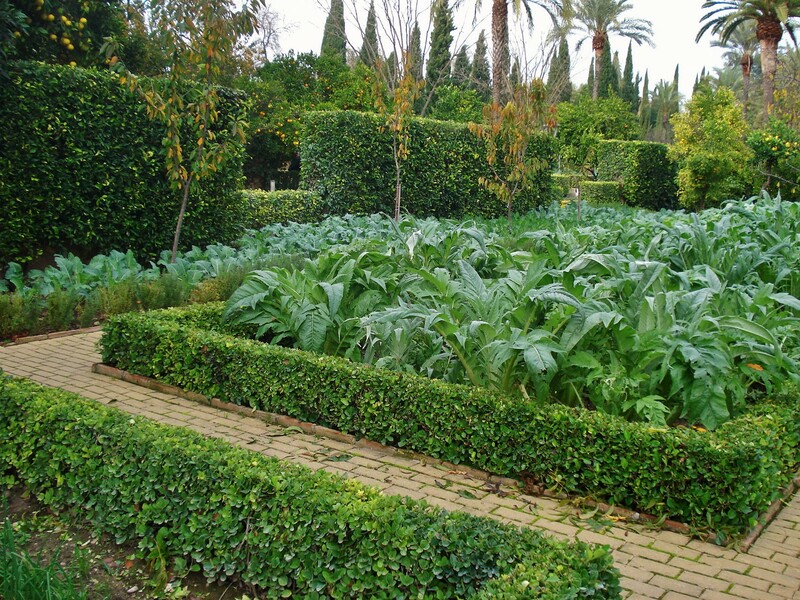 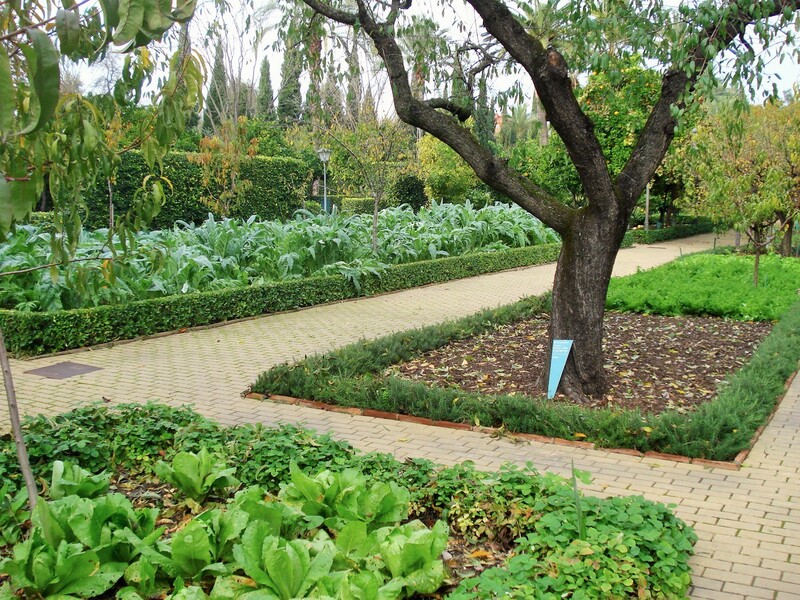 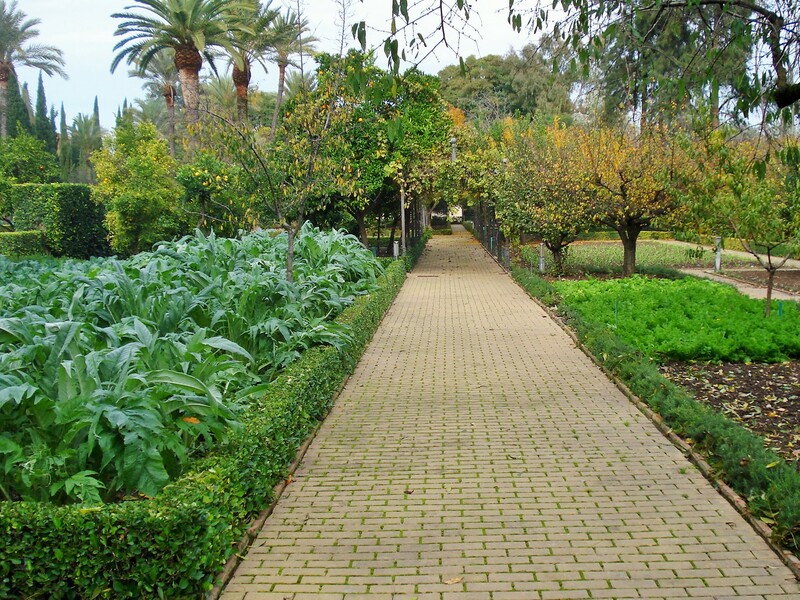 The Botanical Gardens in Cordoba, Spain opened in 1887 and were designed for primarily educational and scientific purposes. 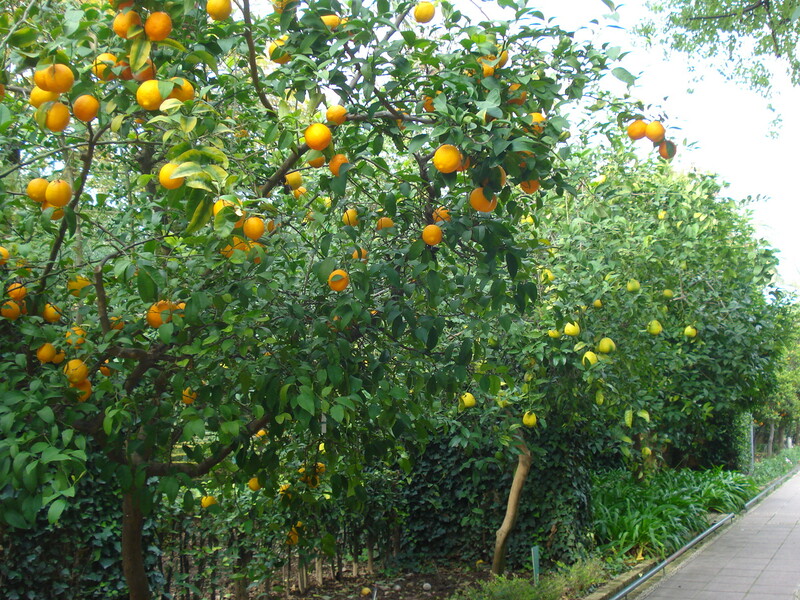 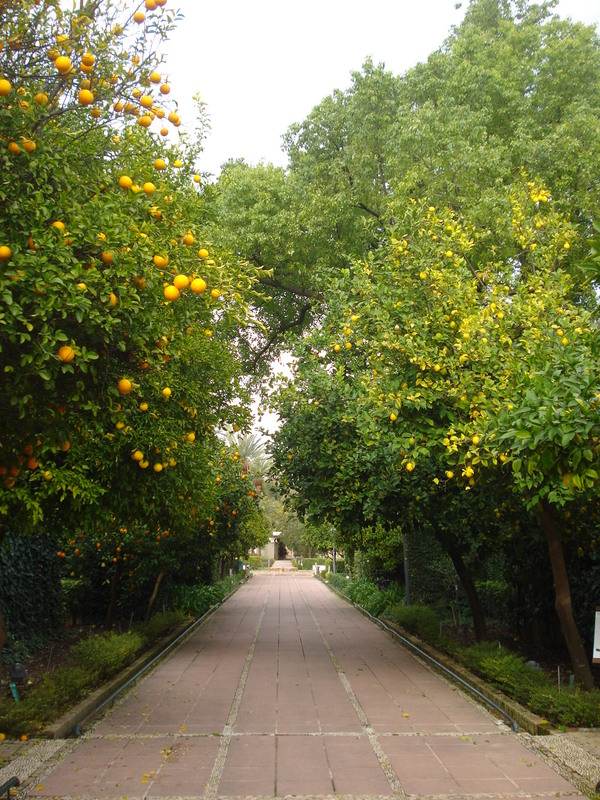 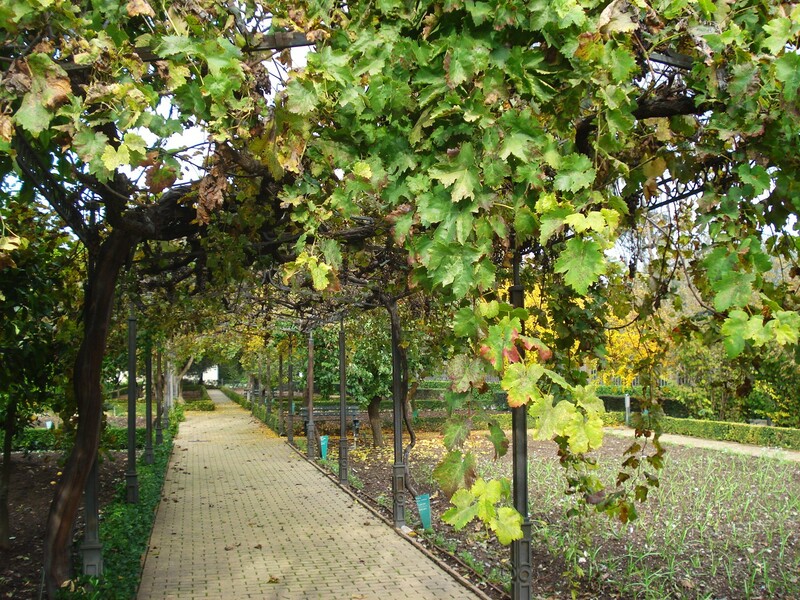 They are laid out along a wide central alley leading on one side to the Collections, species native to Spain arranged in borders edges by low growing rosemary or hackberry, and on the other side the Agricultural School, featured in this post, with a large collection of citrus trees as well as an extensive vegetable and kitchen garden. 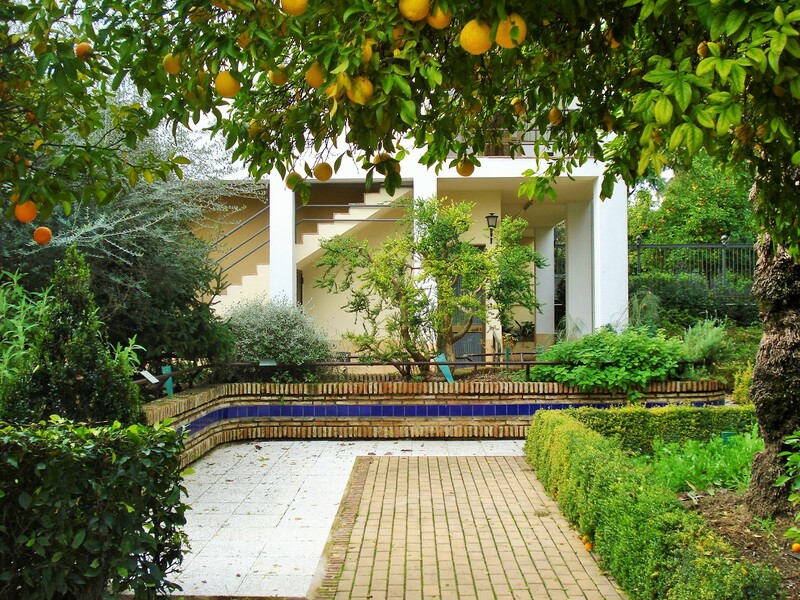 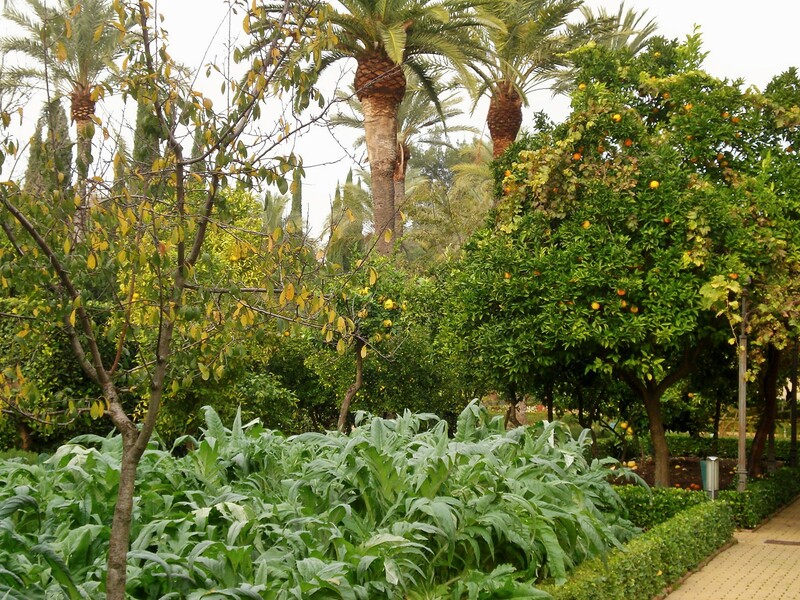 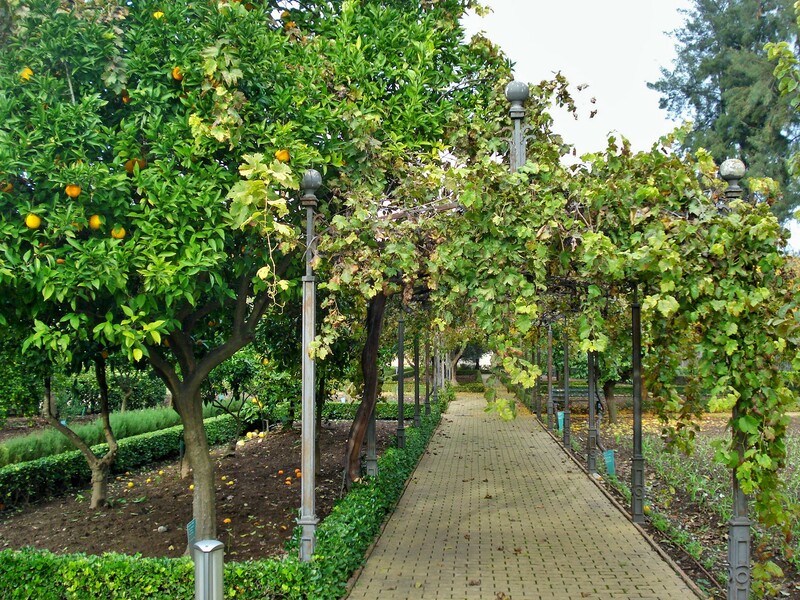 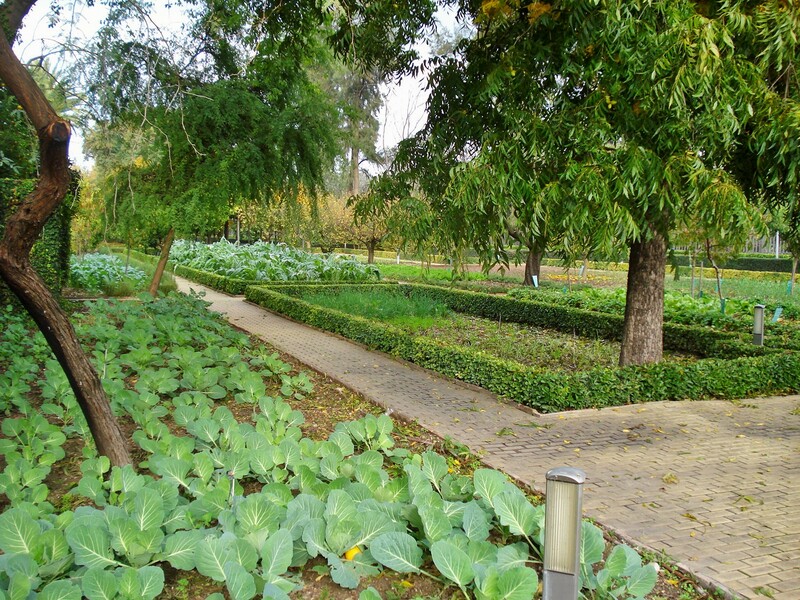 In the center are greenhouses dedicated to species from the Canary Islands, Balearic Islands and Andalusia, as well as a lovely area dedicated to the Andalusian patio. 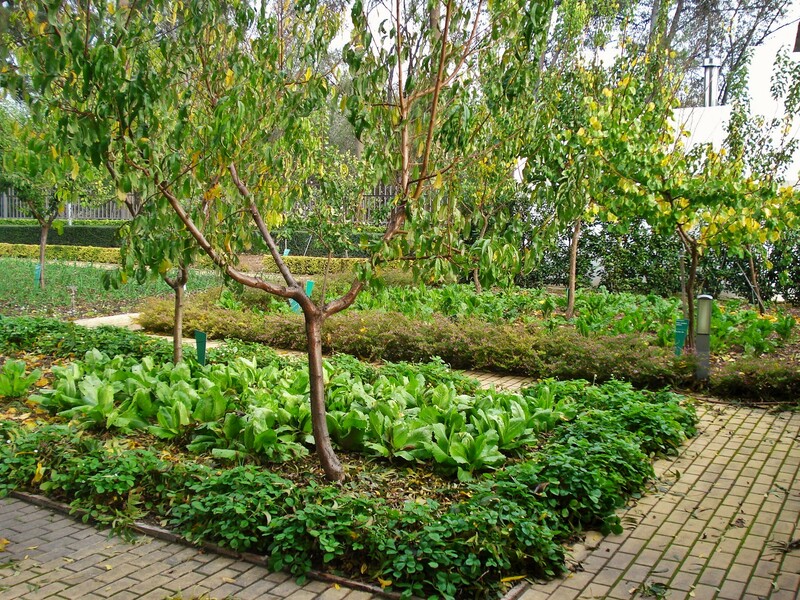 In the School of Agriculture, the emphasis is on sustainability and diversity, with sustainability and organic gardening on the forefront. 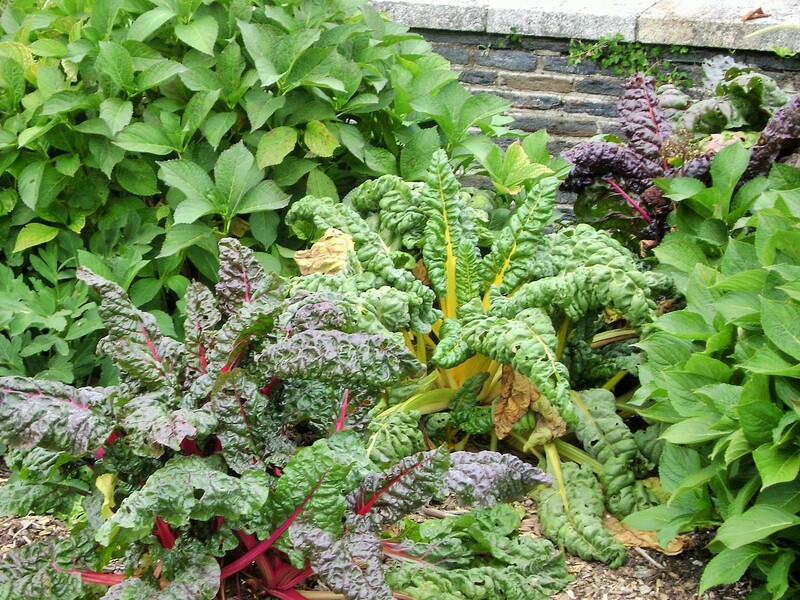 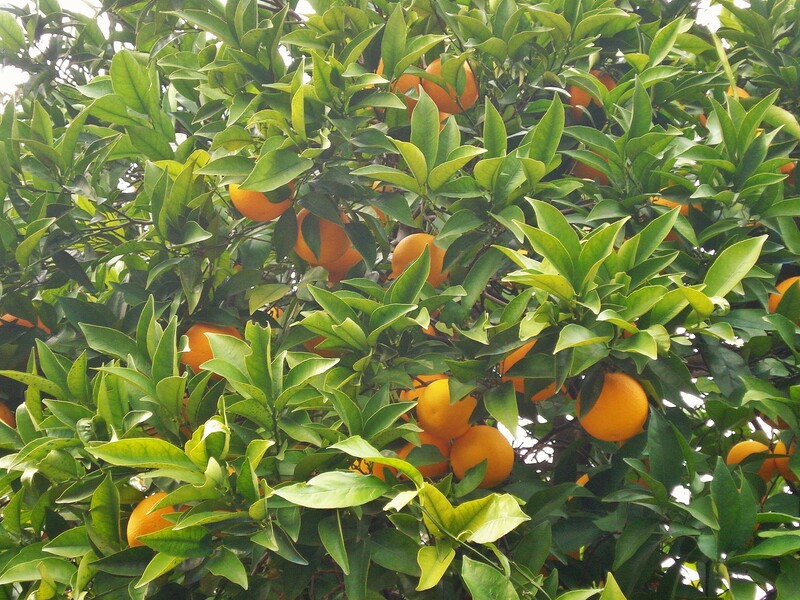 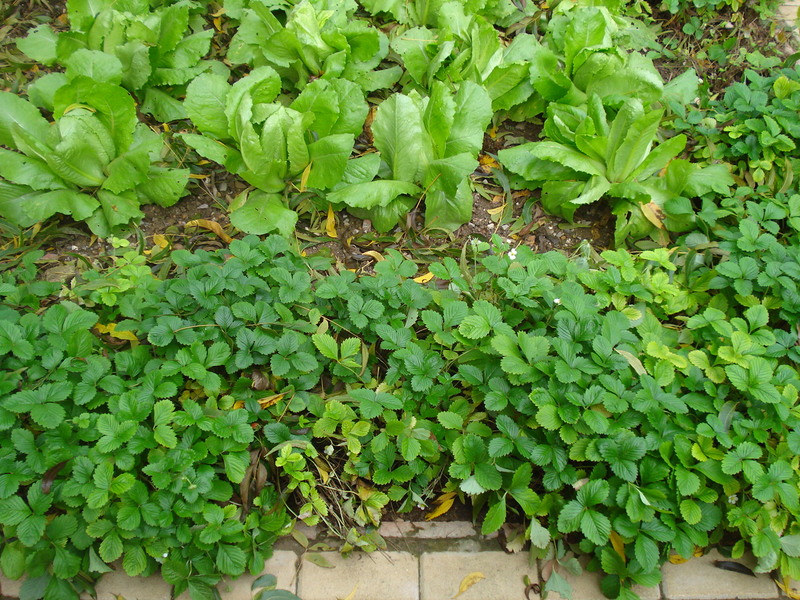 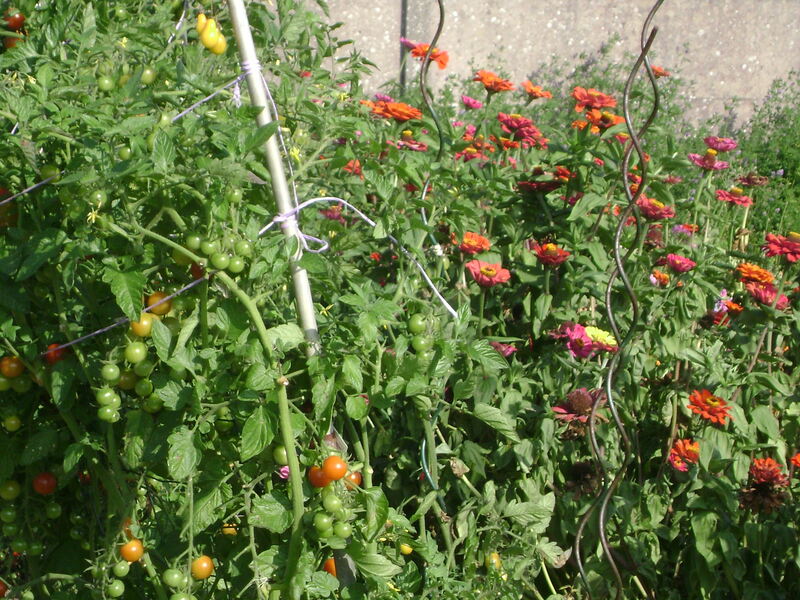 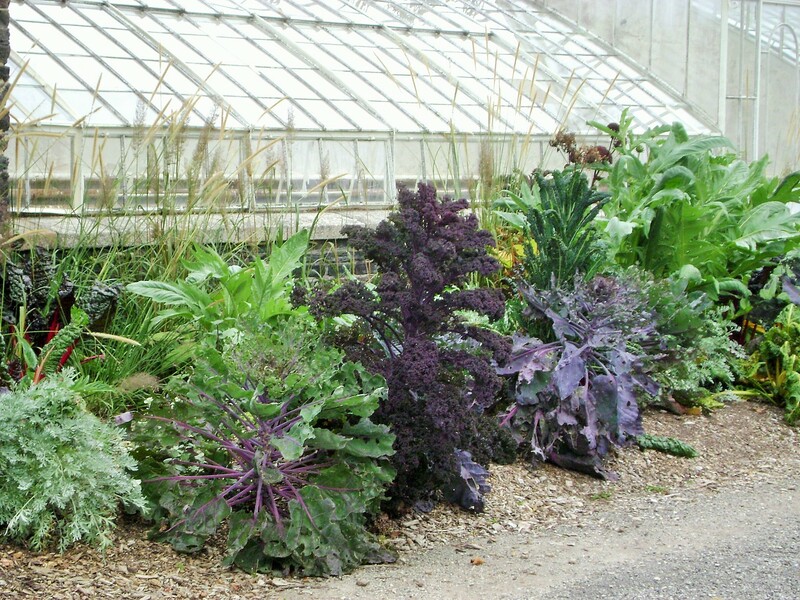 Plants grown are those for human or animal consumption as well as any plants offering benefits or use to people. 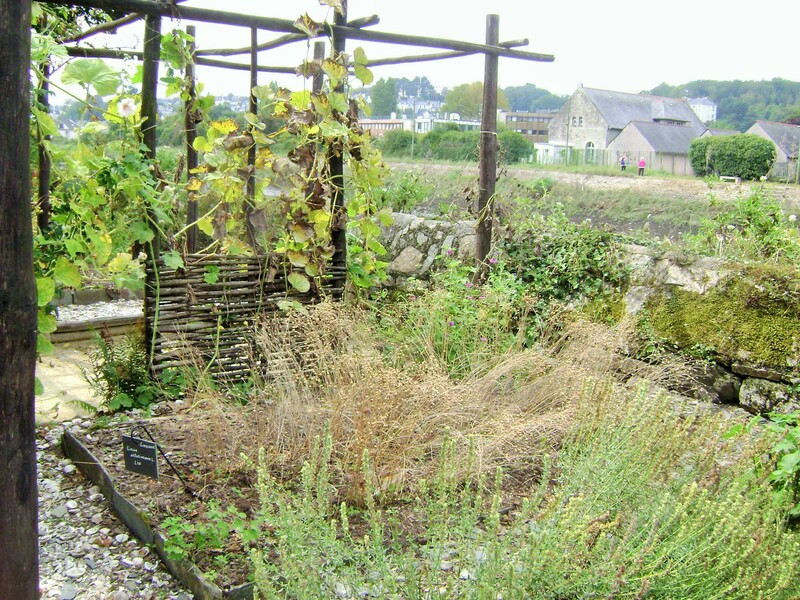 Many different methods of cultivation are used and in those collection one can observe the different cycless of plants through the seasons. 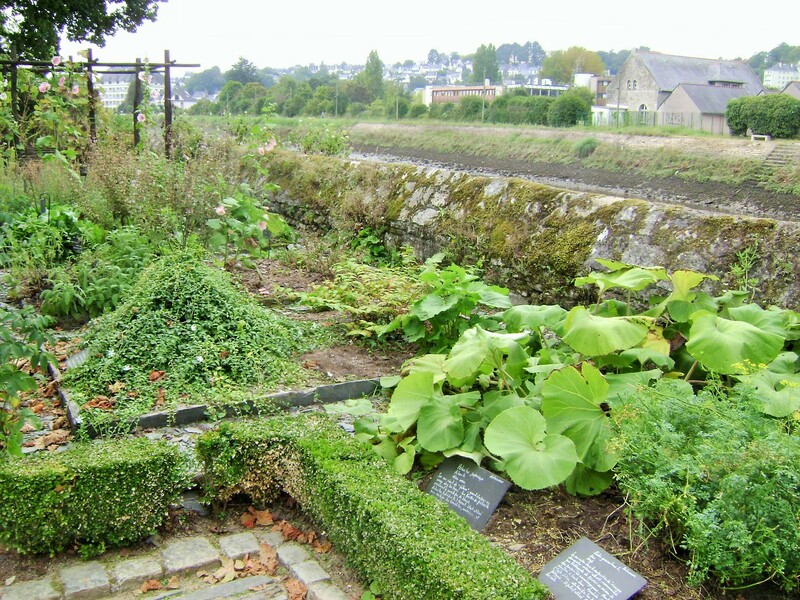 The castle of Trevarez near Chateauneuf du Faou in northern Brittany, France, is one of the last great castles built in France. 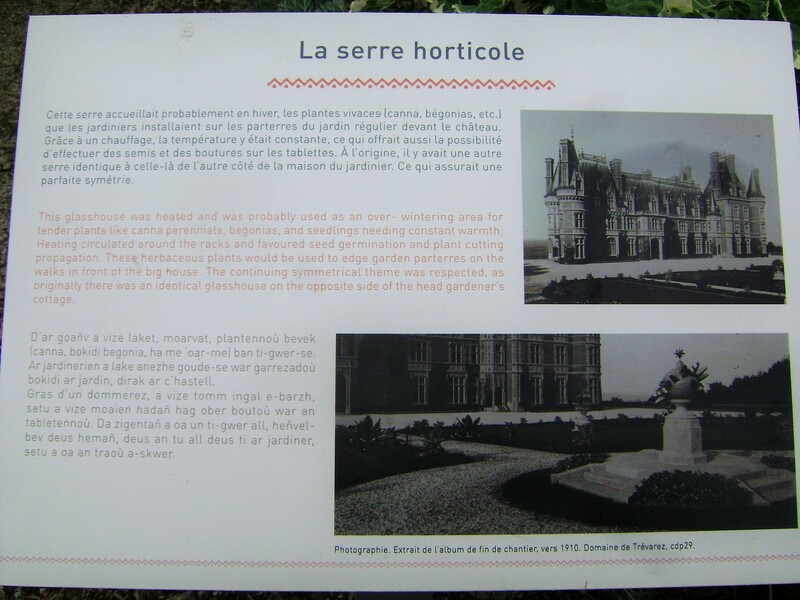 Construction began in 1892 for a French politician and brought together all the faste and excess of the Belle Epoque, frescoes, carvings, marble, mosaics, ornate panels and fireplaces. 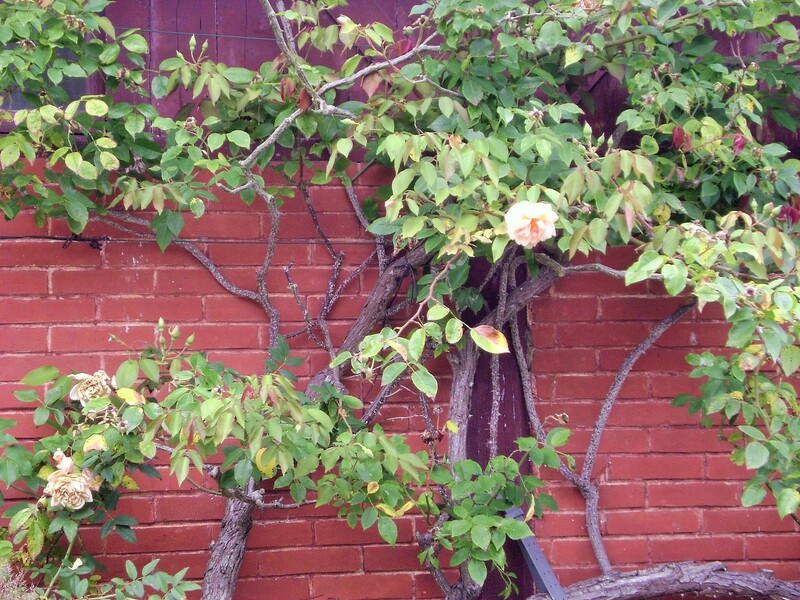 It is often referred to as the pink or red castle, because of the pink color it gets from the bricks used. 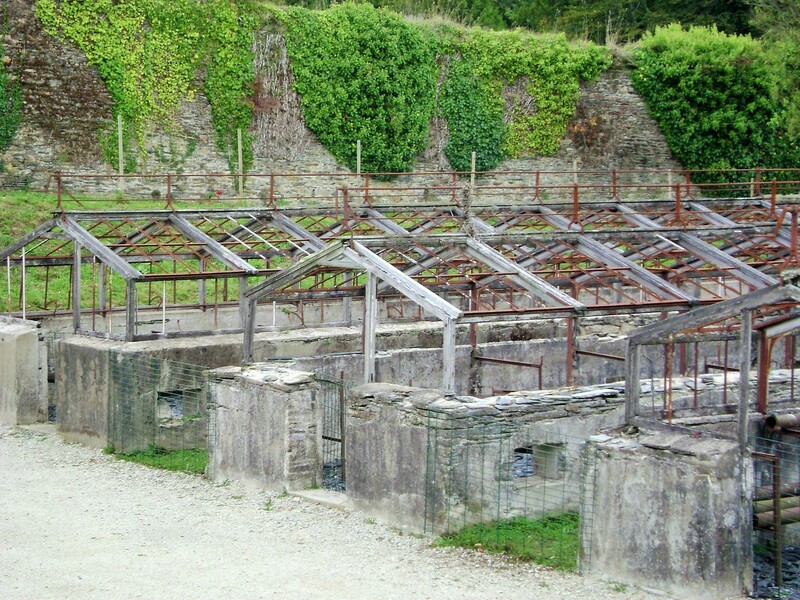 It was unfortunately bombed in the 1940s, and has not been occupied since, but it is being renovated by the government who purchased it in the 70s. 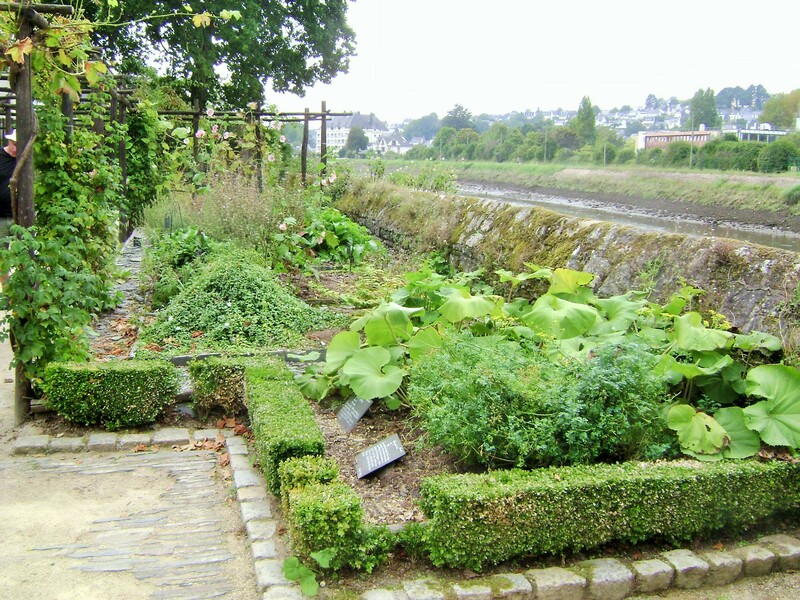 The gardens were neglected as well for many years and have been slowly brought back to their original glory, one area at a time. 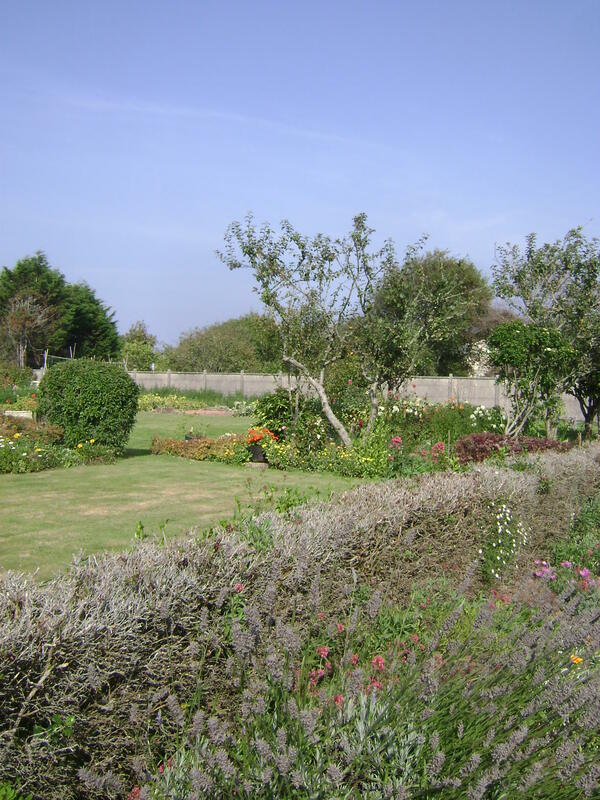 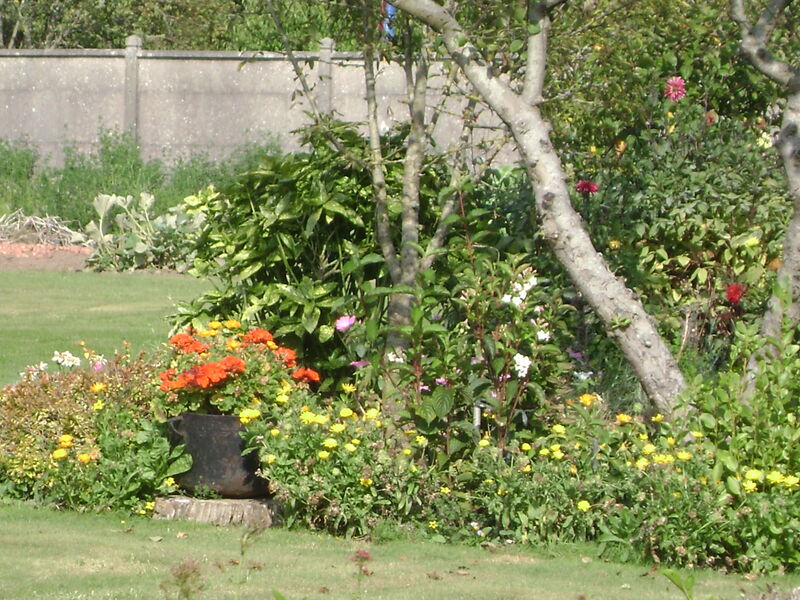 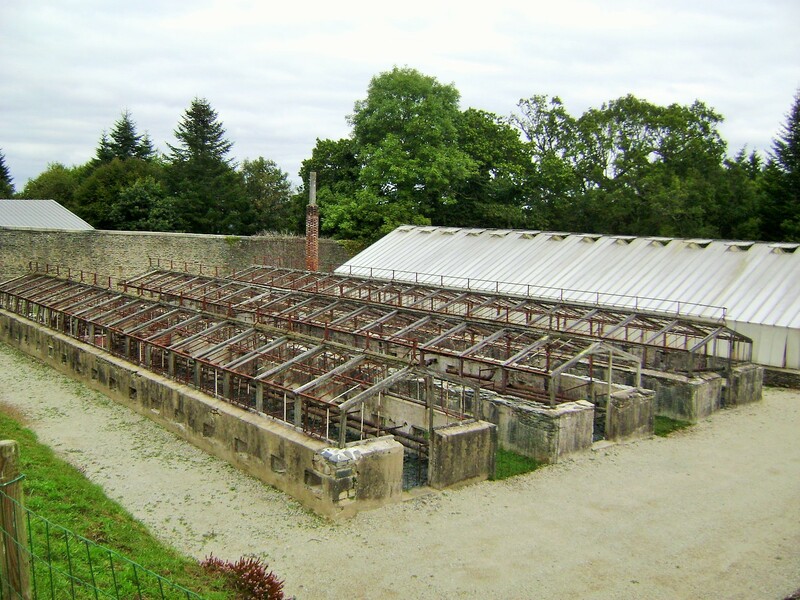 The grounds are extensive, with stables, a large wash house, theme gardens, formal gardens and much more. 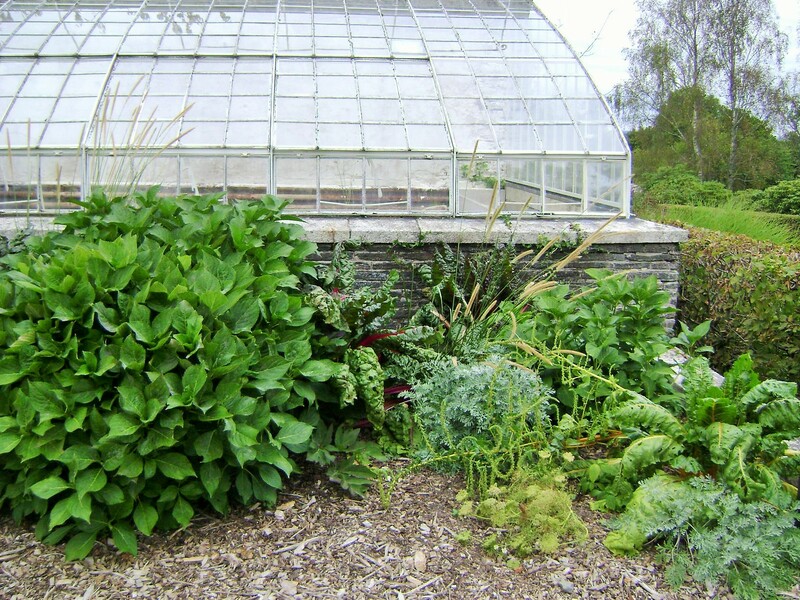 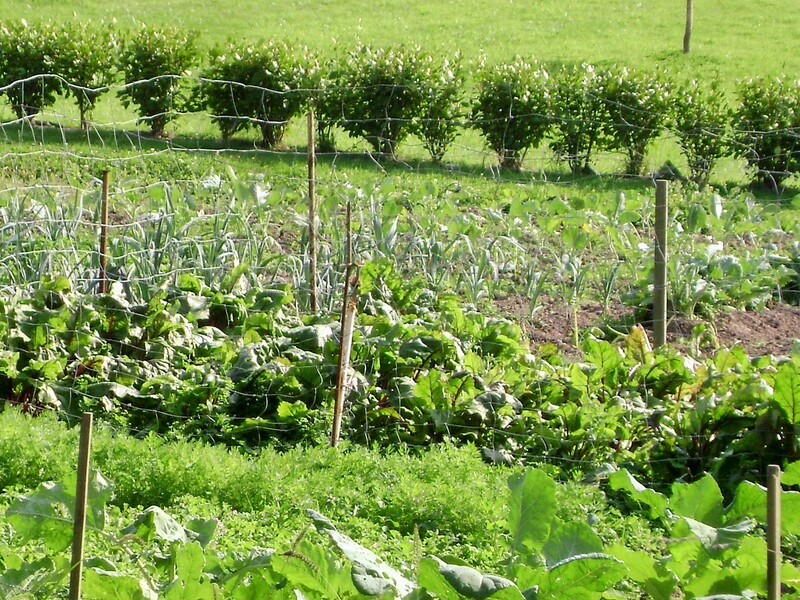 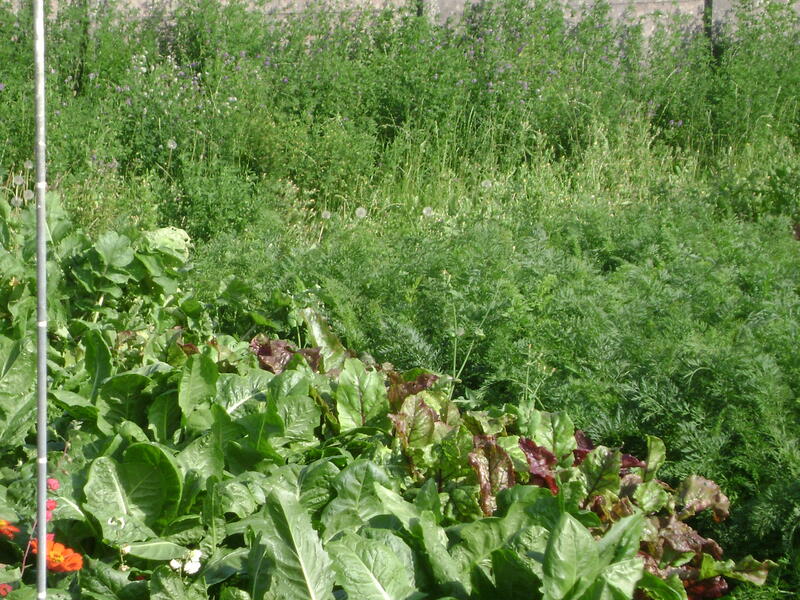 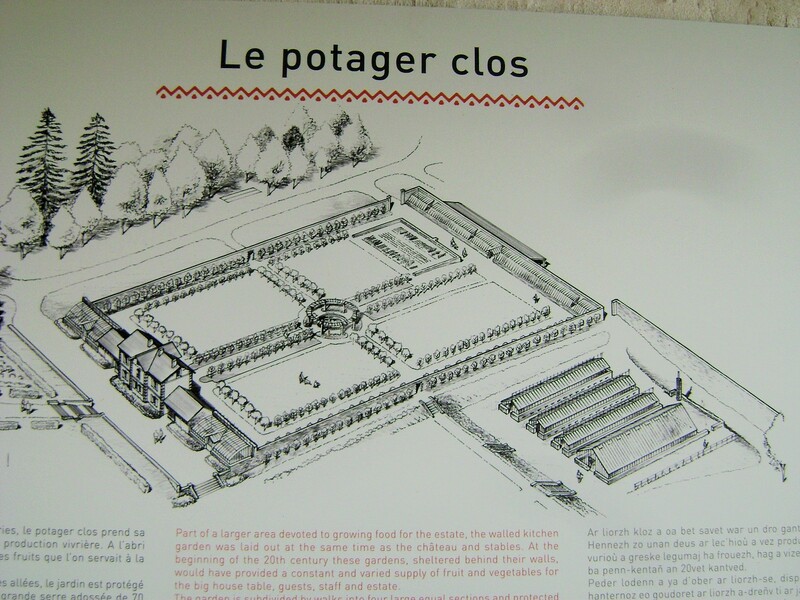 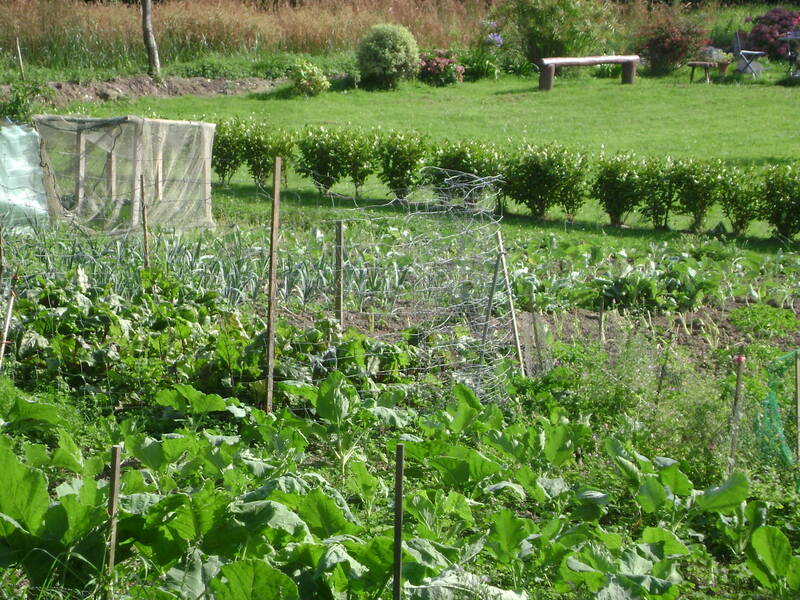 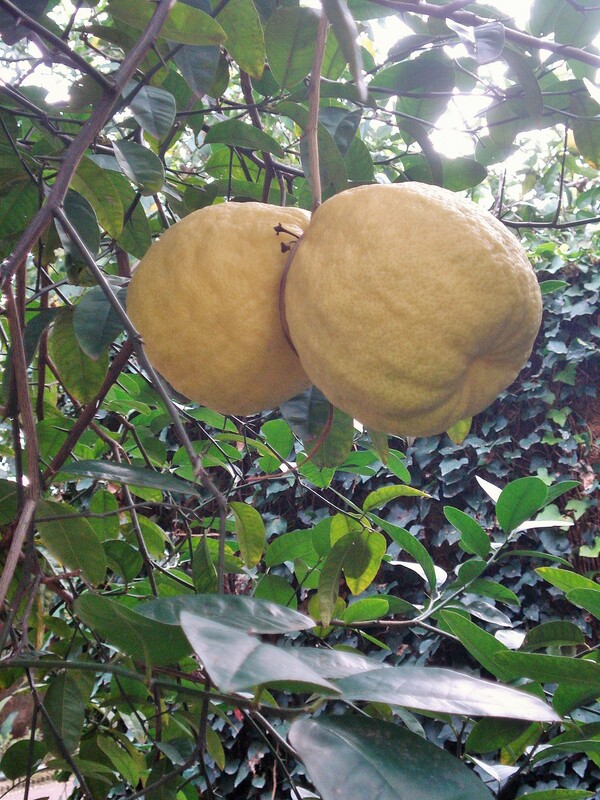 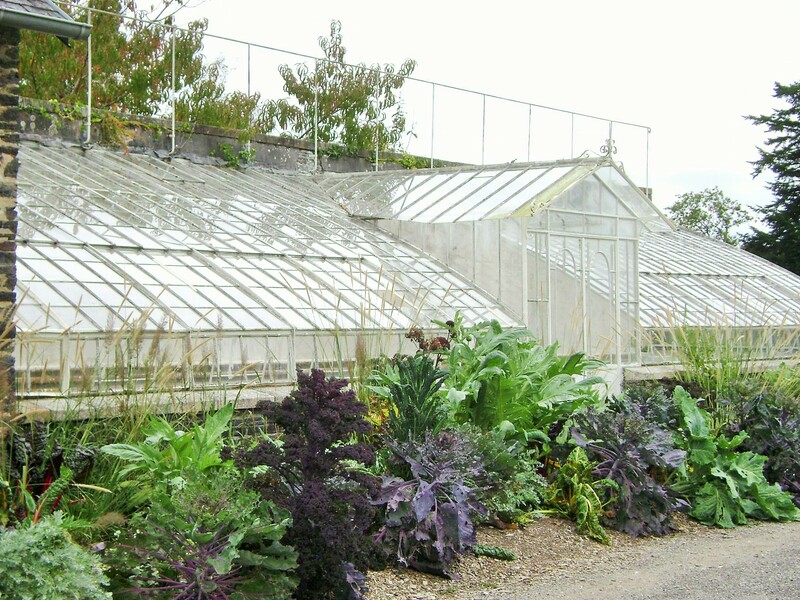 In this post, I am featuring the potager, or kitchen garden and the greenhouses. 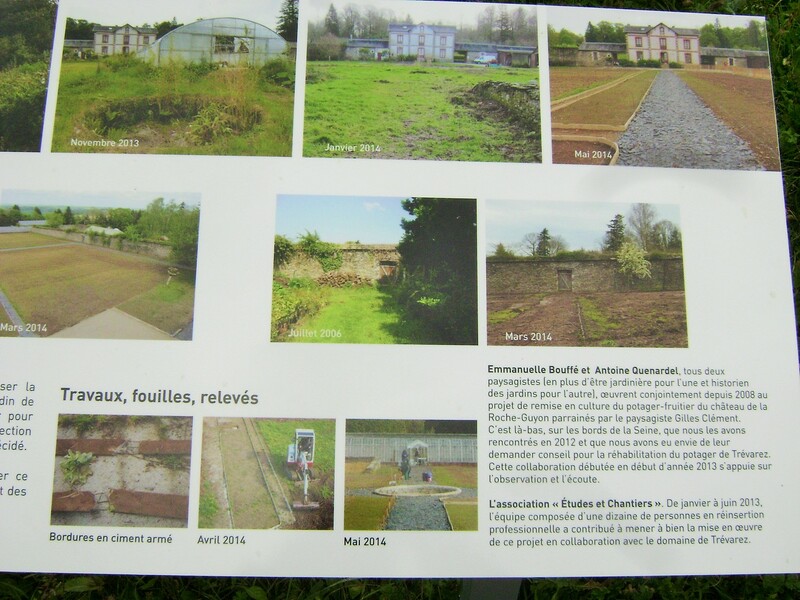 They have been under renovation since 2013 after being abandoned for many years. 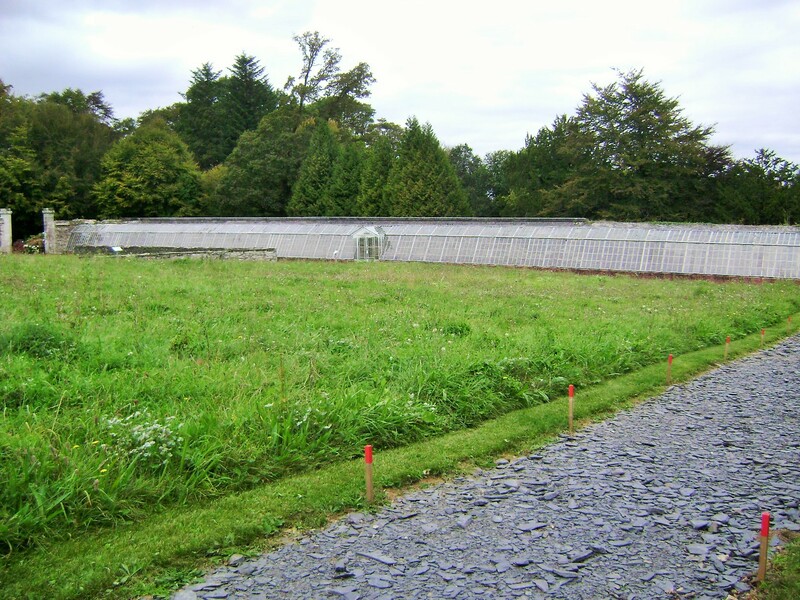 Historians, landscape designers, gardeners and staff cleared out the brush while cataloguing the plants found and located the original concrete edging to the borders and the central water pond. 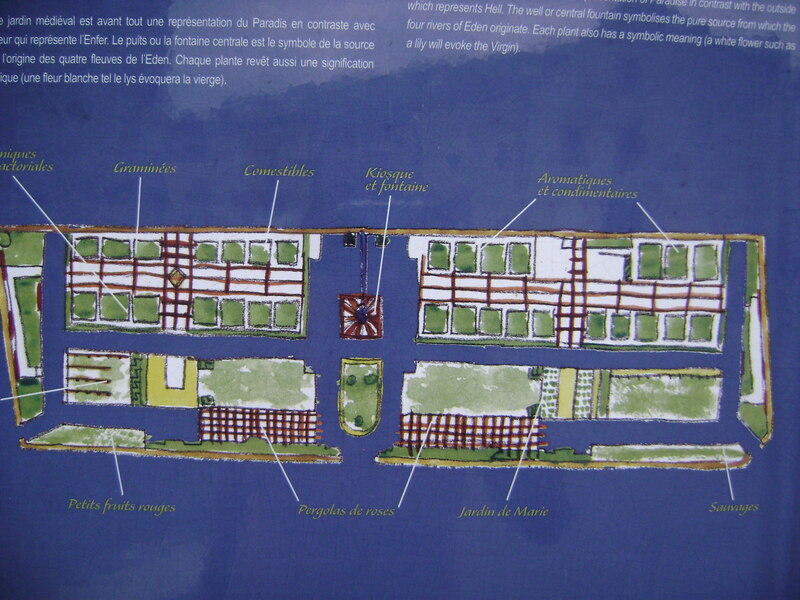 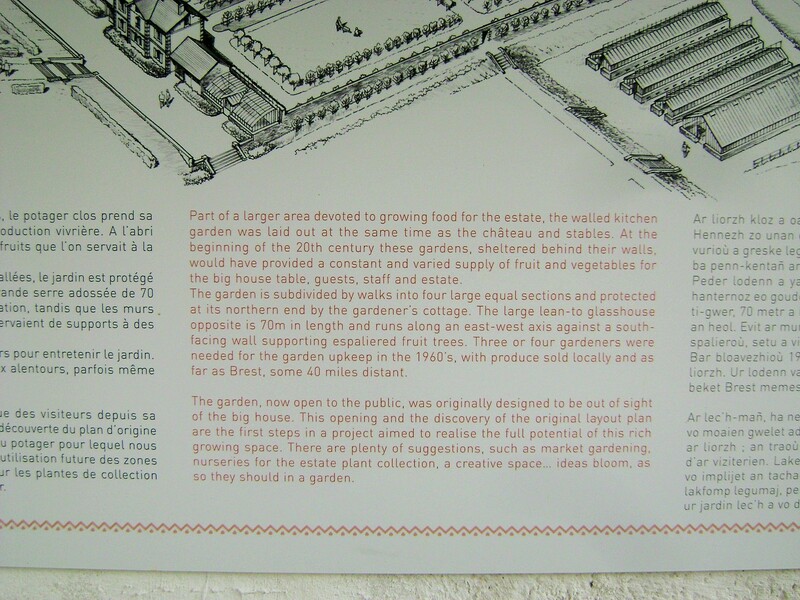 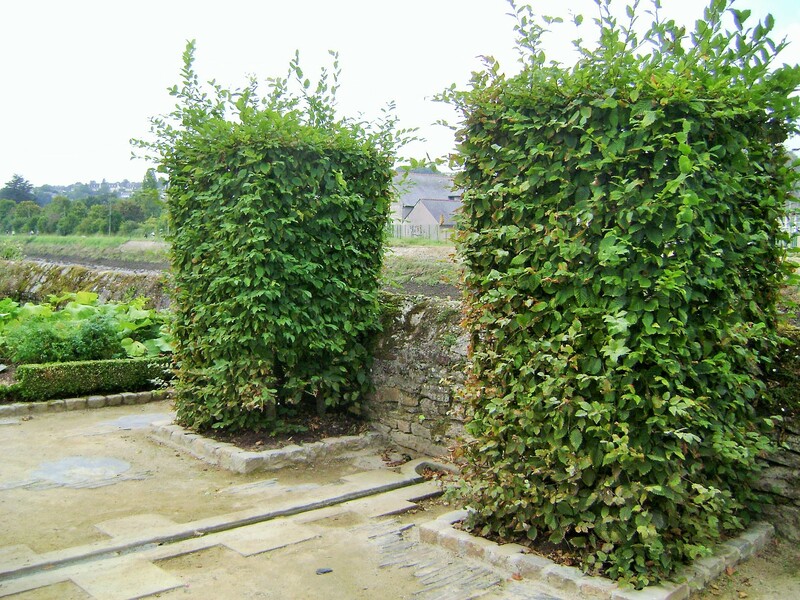 They were able to begin to recreate the four large quadrants that made up the walled kitchen garden. 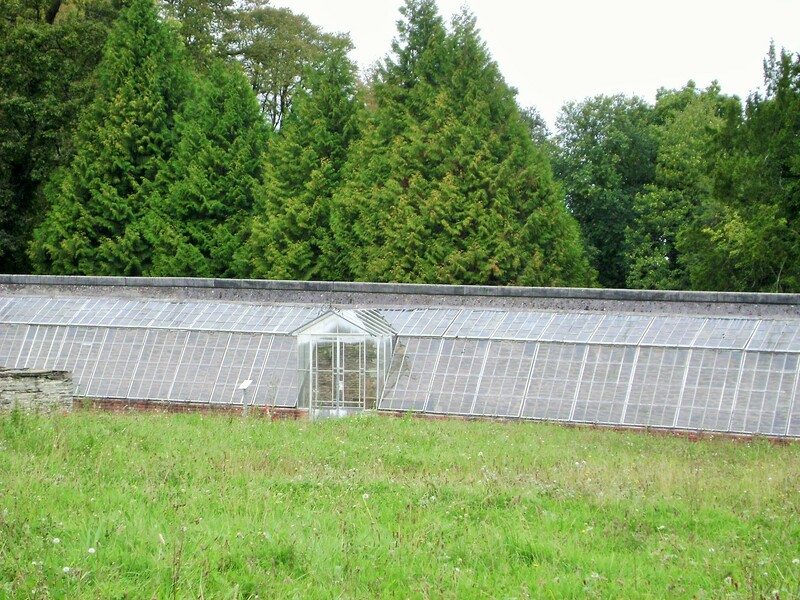 A large greenhouse closes in the potager at one end, and on the other side of one wall are the rest of the greenhouses. 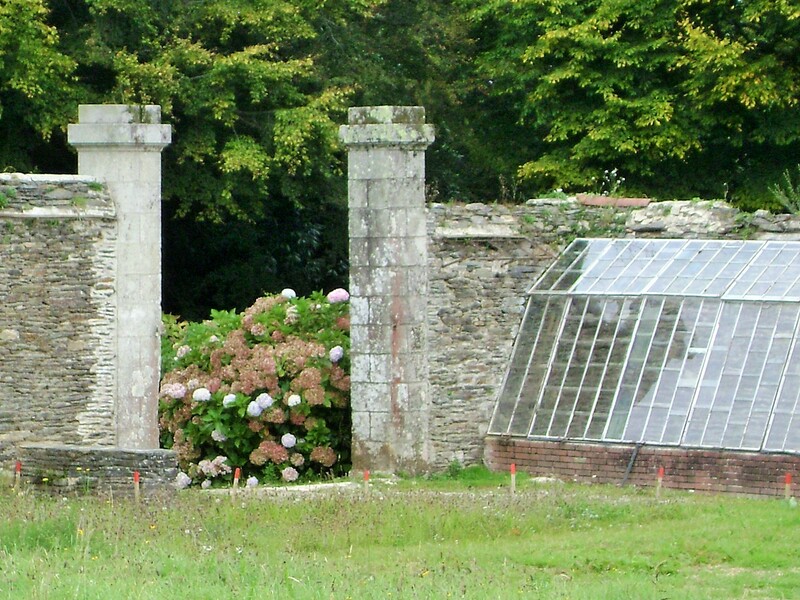 The other greenhouses for the potager are still standing but also in need of renovation. 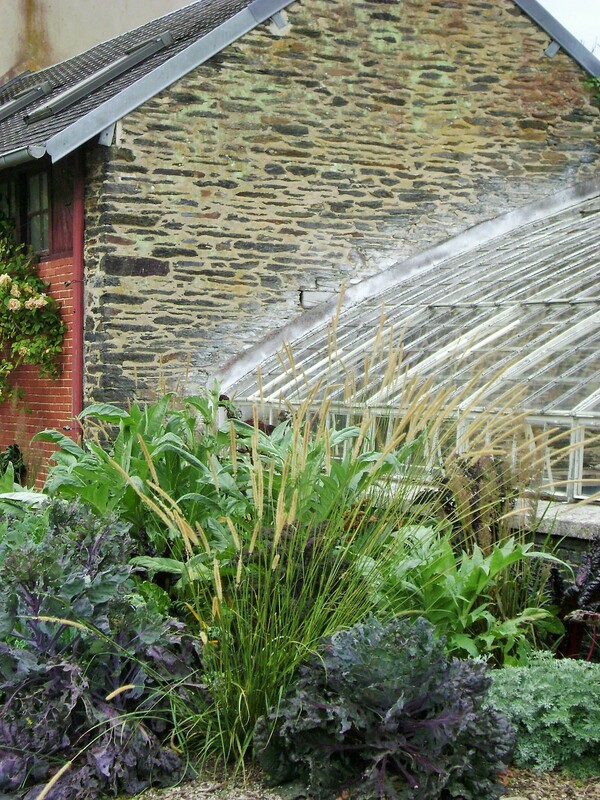 The gardener’s cottage and annex has a lean in hothouse that was used at the time for exotic plants and hothouse flowers. 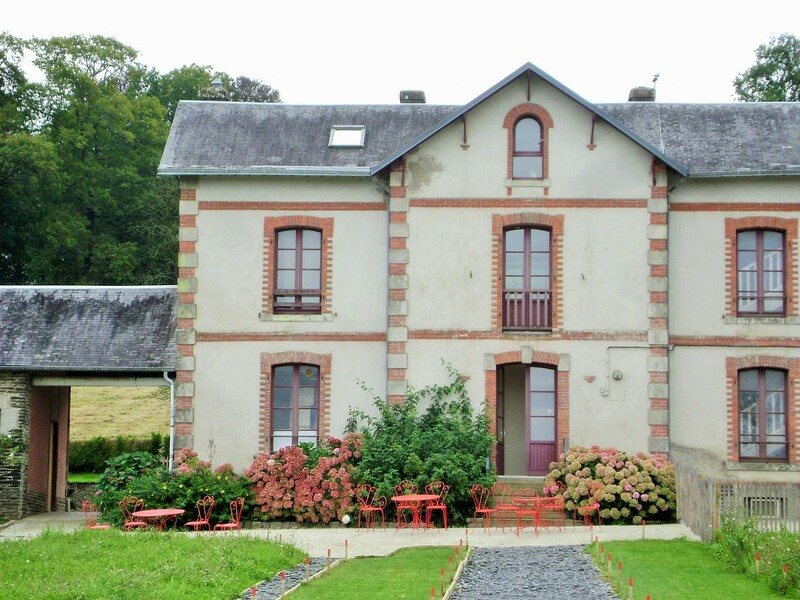 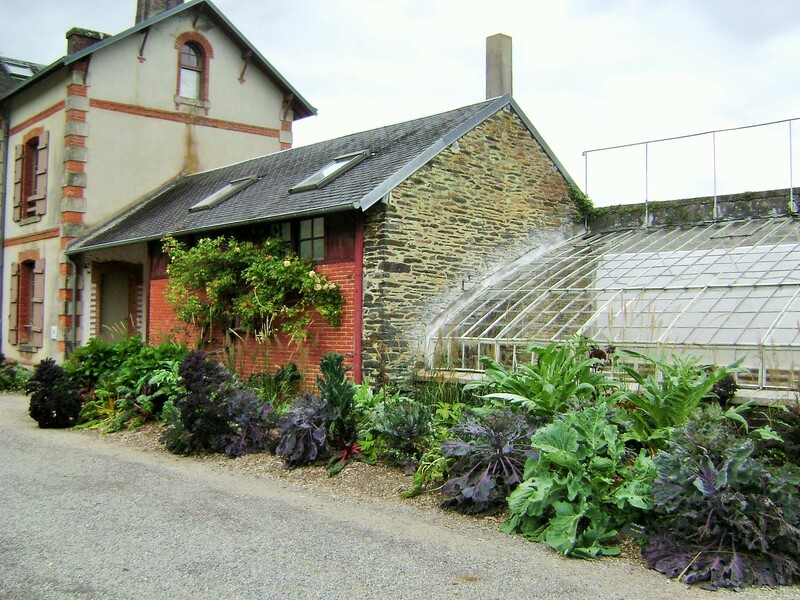 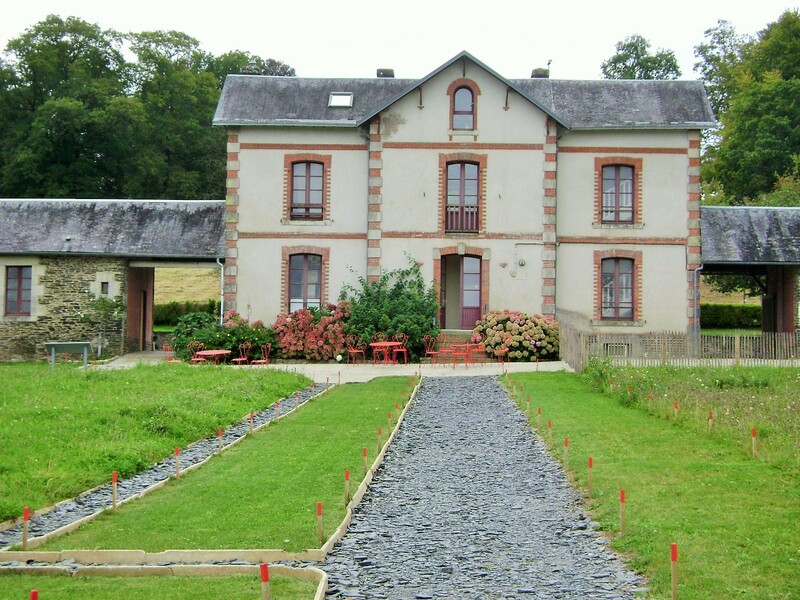 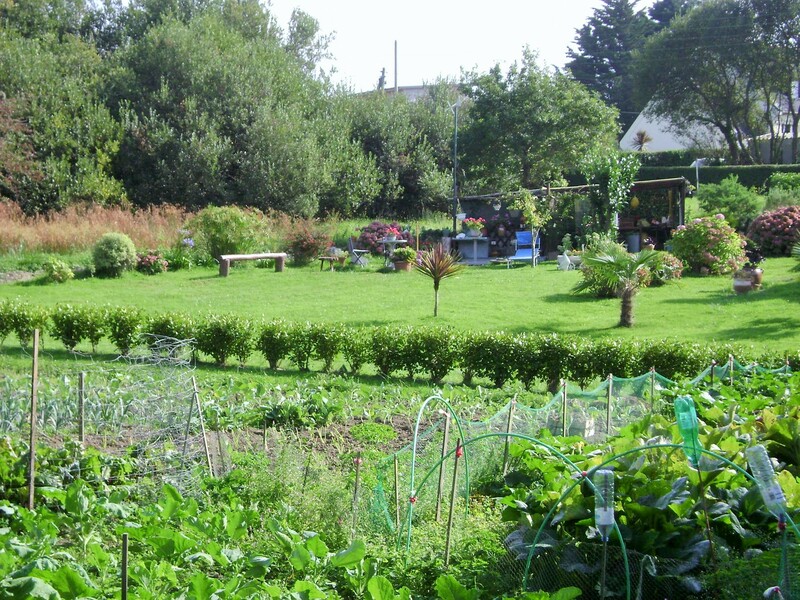 Near the coast in northern Brittany, France, this house is surrounded by a neatly landscaped lawn area with benches and sitting areas; then further from the house is the kitchen garden with vegetable patches planted in orderly rows. 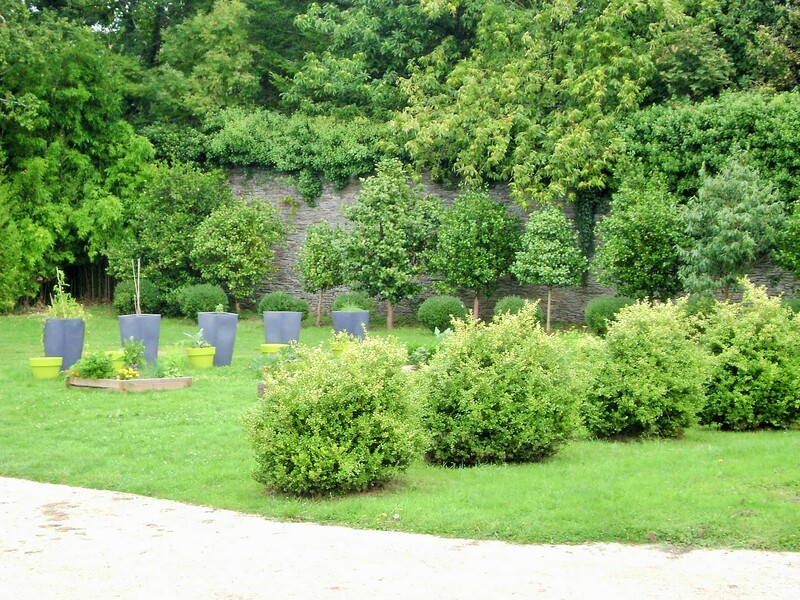 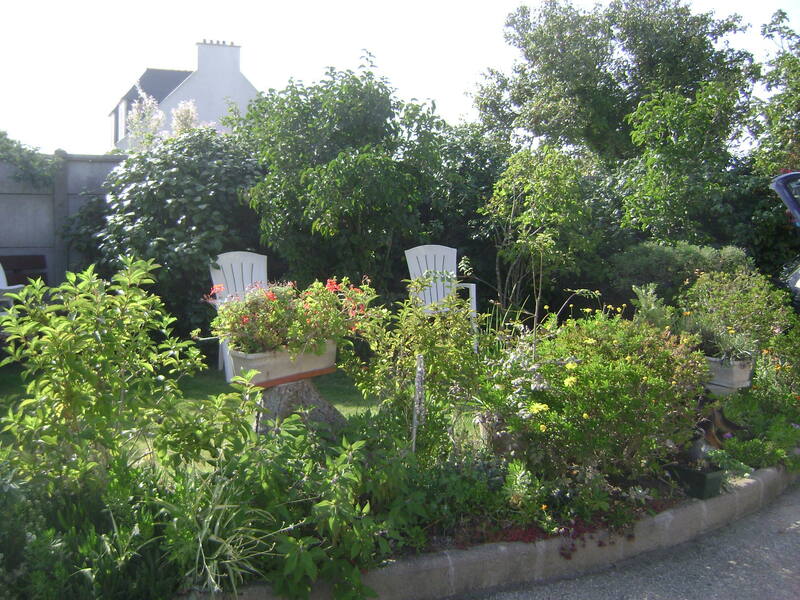 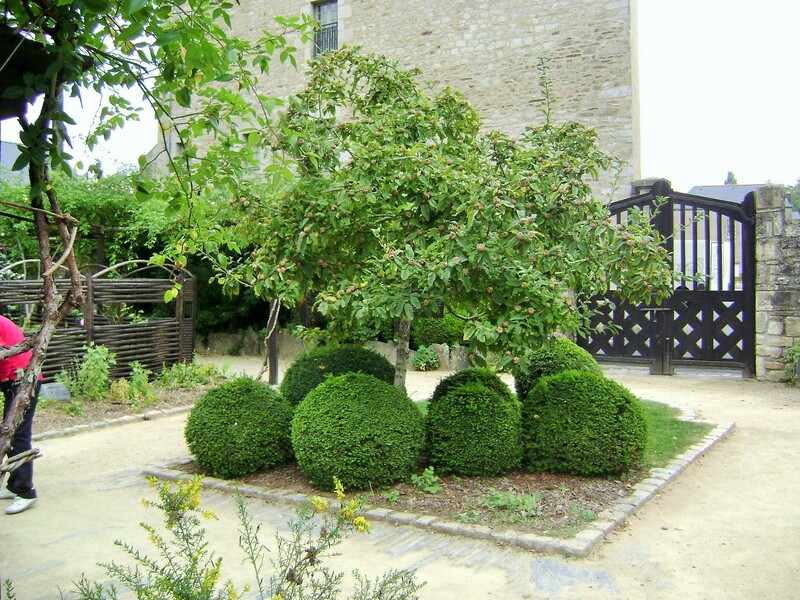 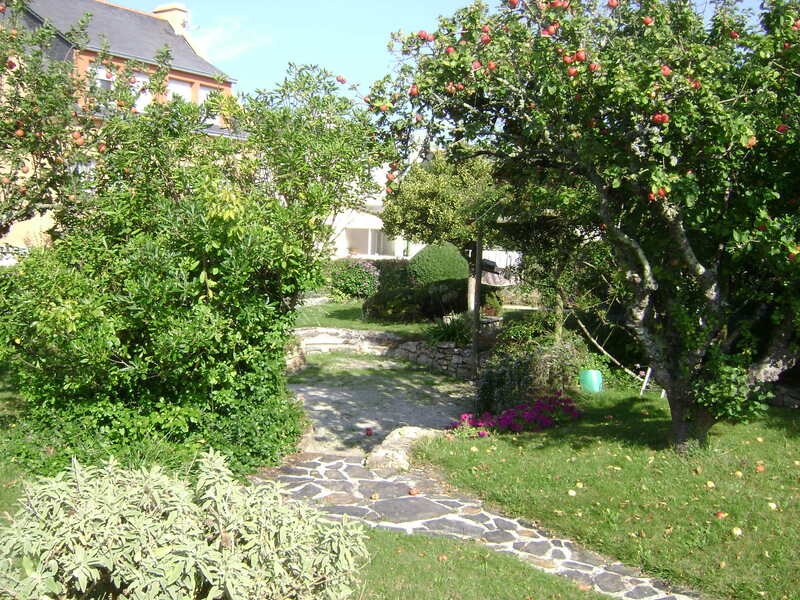 This garden is very reminiscent of what the French used to call a “jardin ouvrier”. 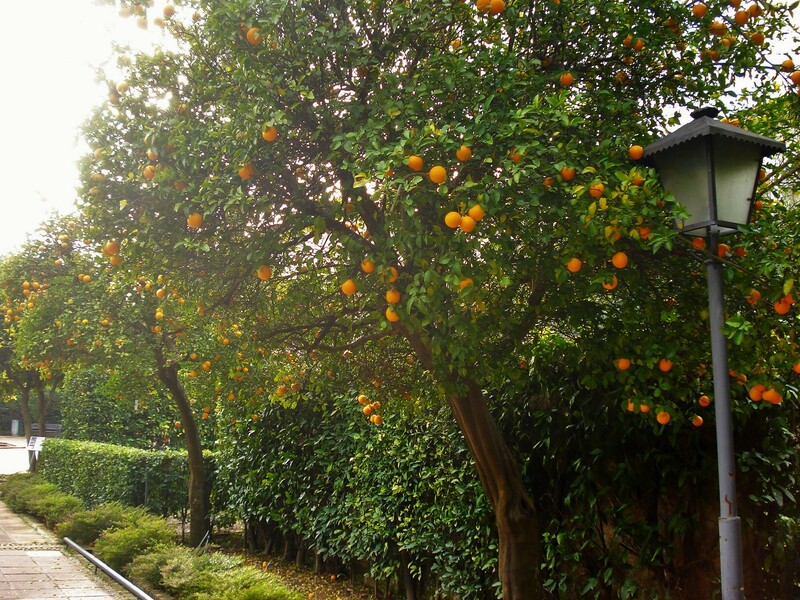 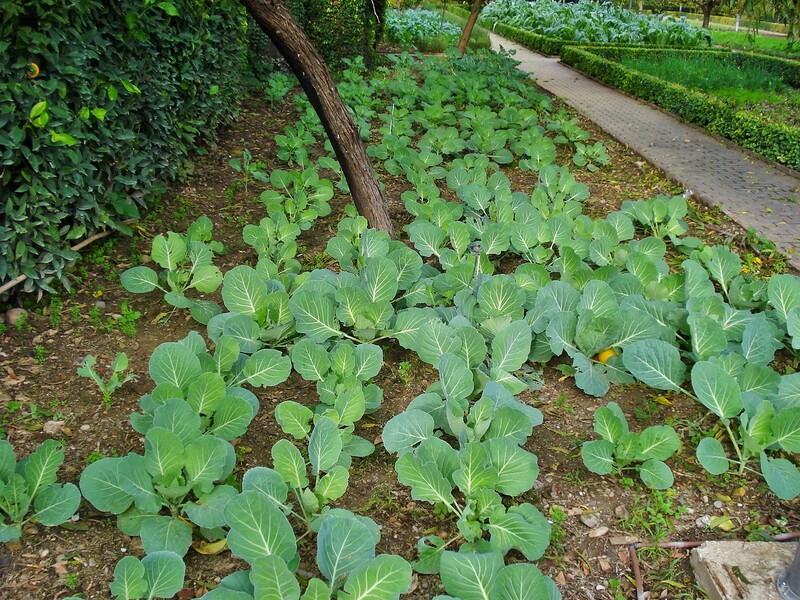 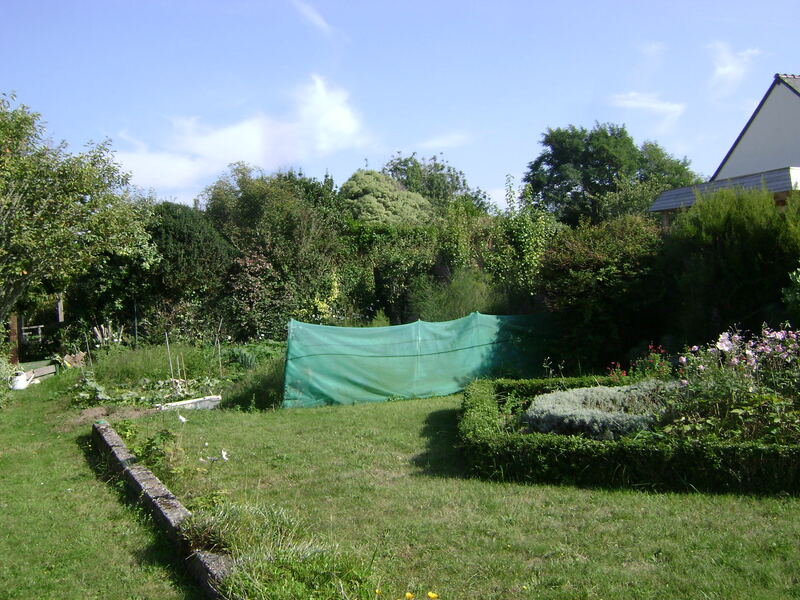 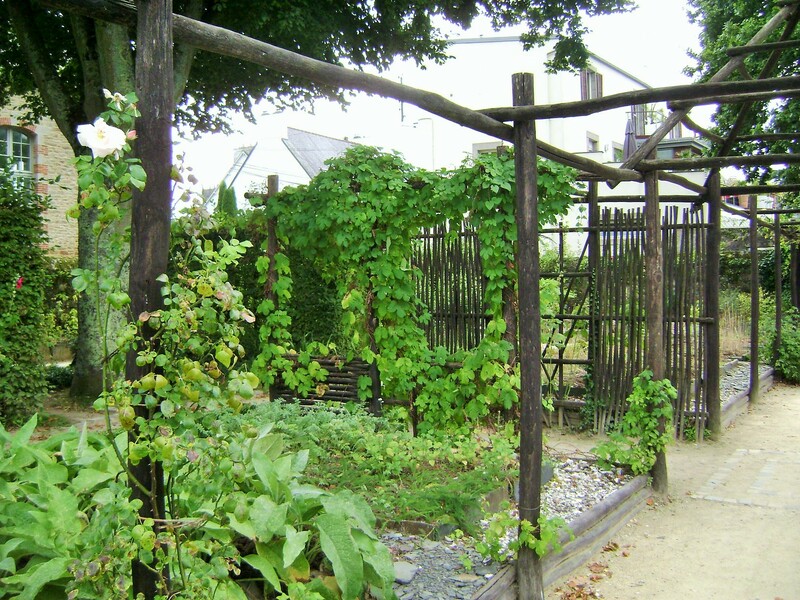 Literally meaning “workingman’s or bluecollar garden”, it refers to gardens that while having very much the look of cottage gardens served the very functional purpose of having to feed a family. 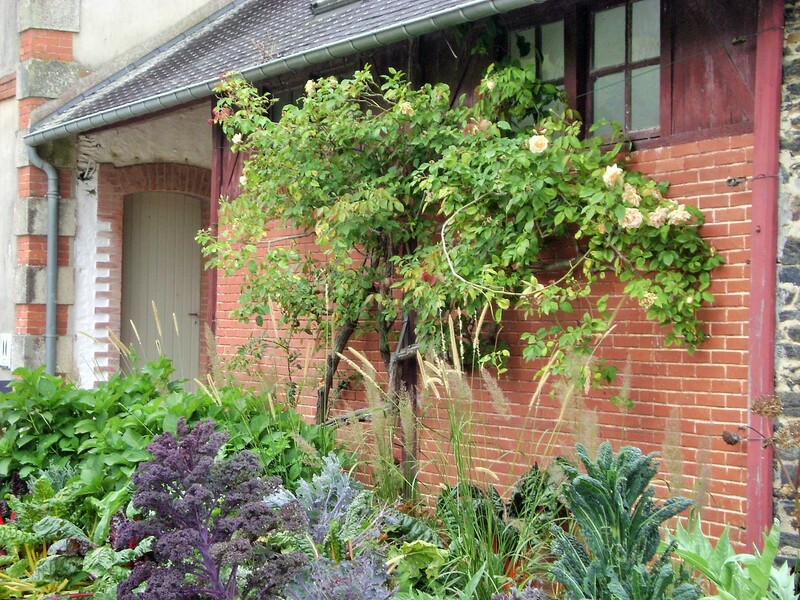 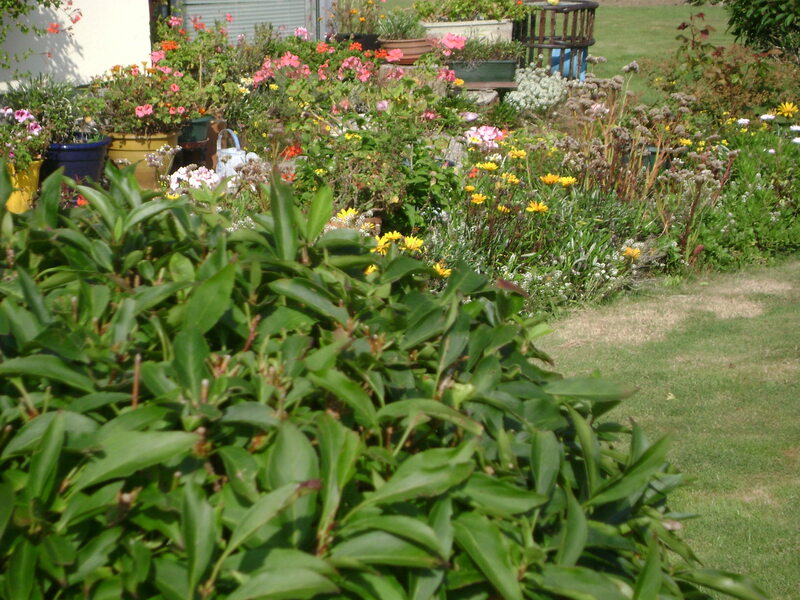 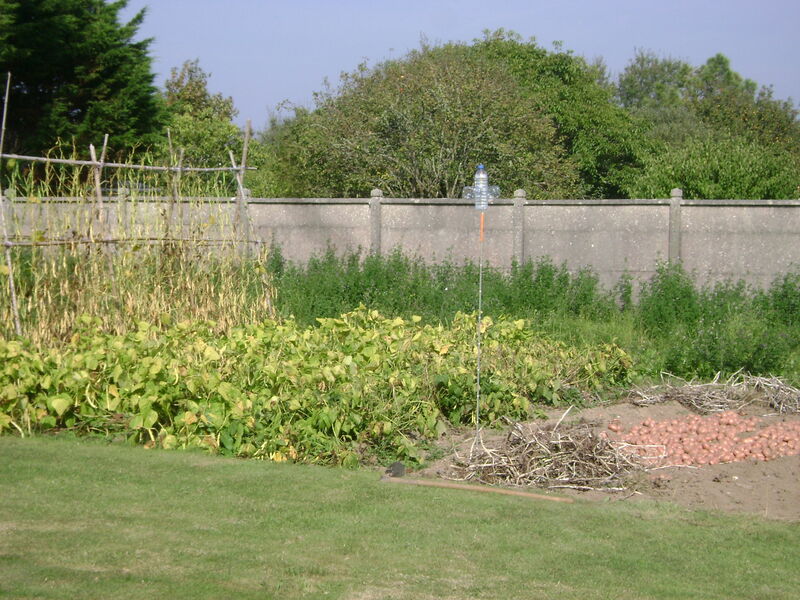 Typically there will be a kitchen garden in the back or side of the house, with a flowered area in the front. 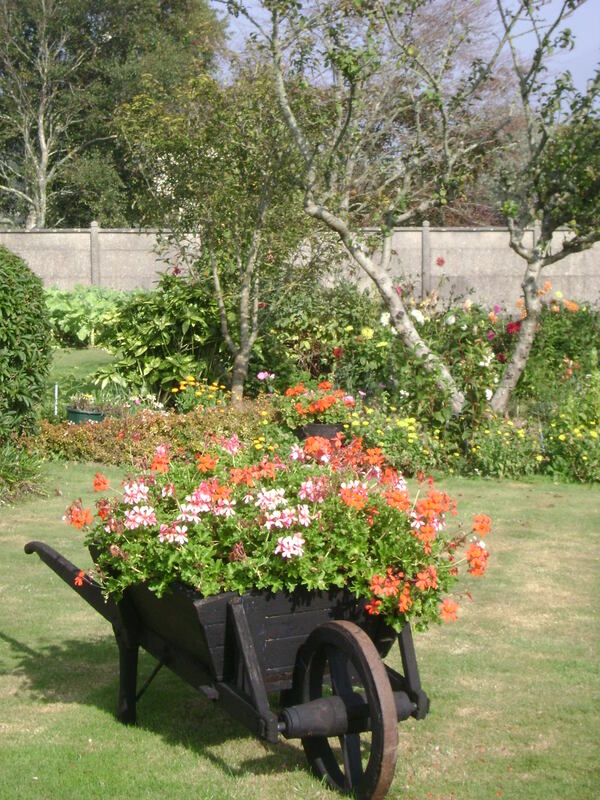 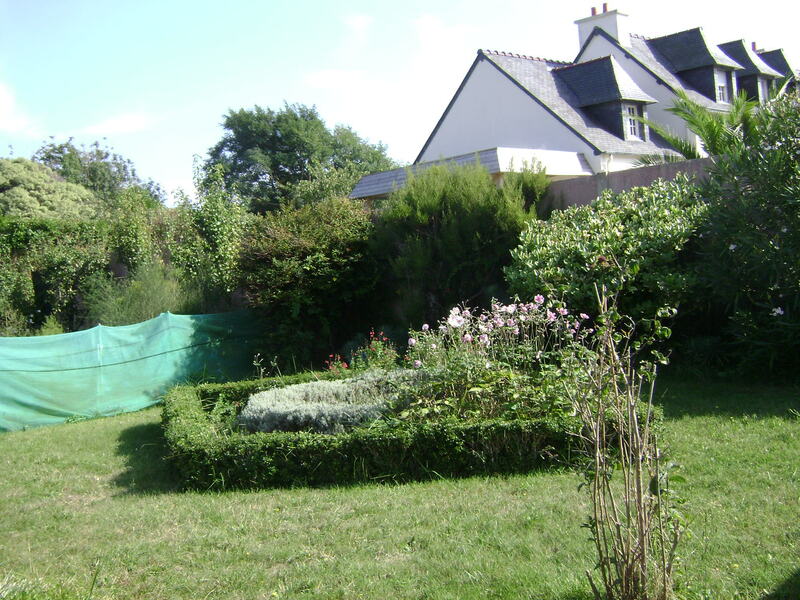 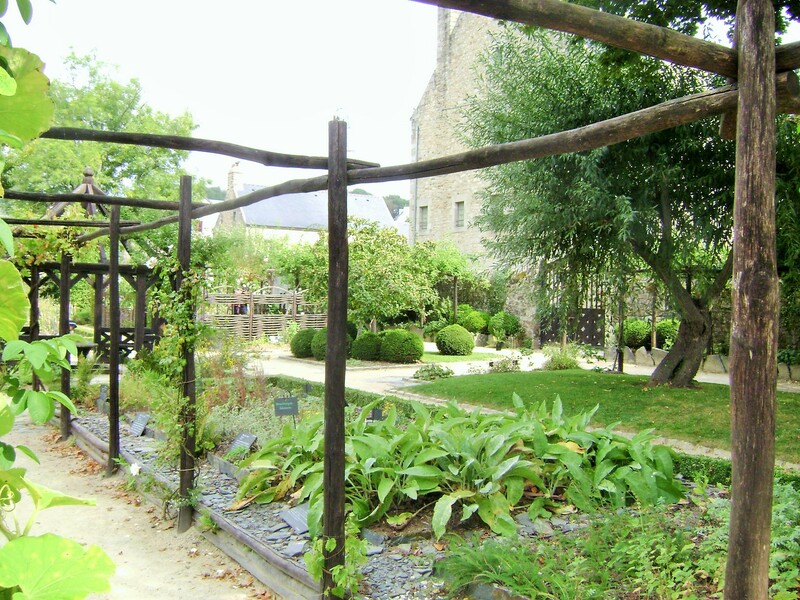 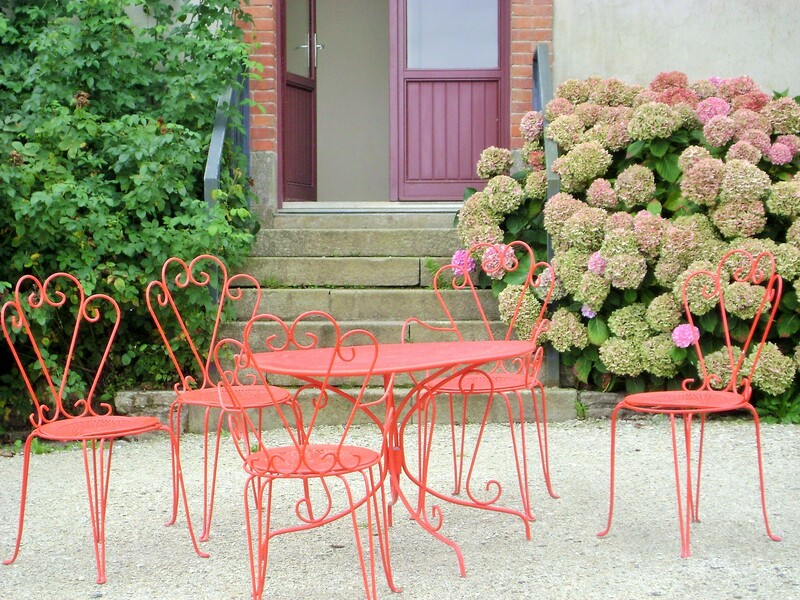 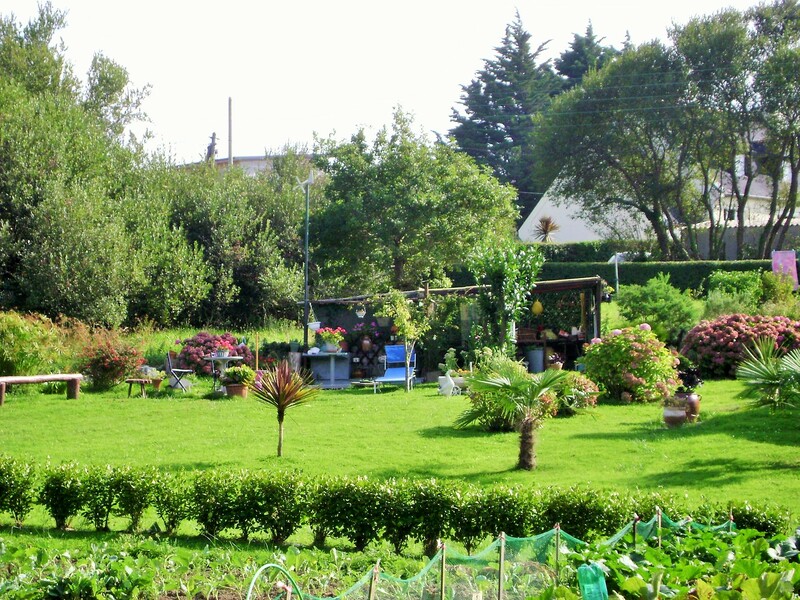 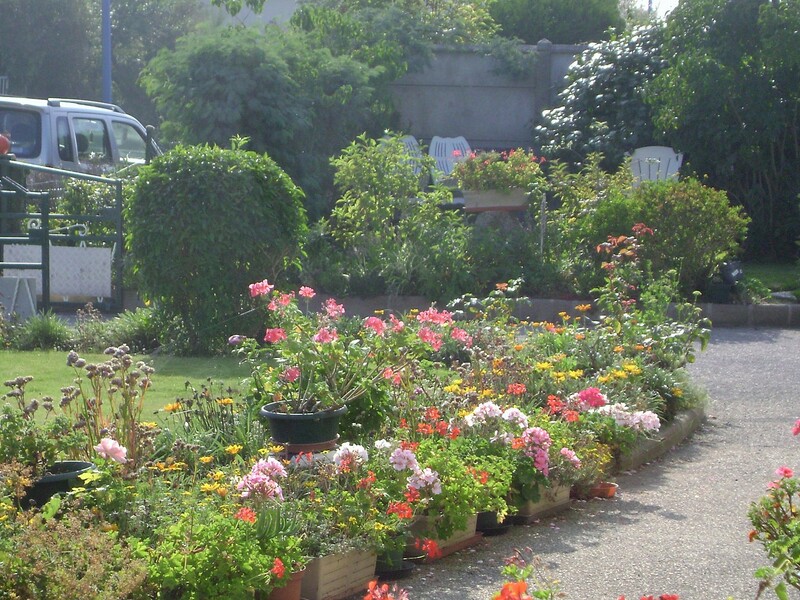 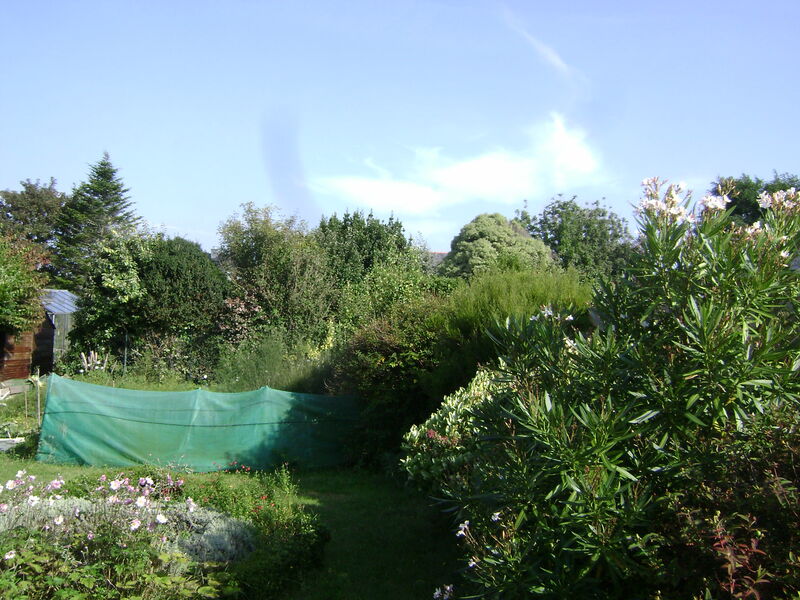 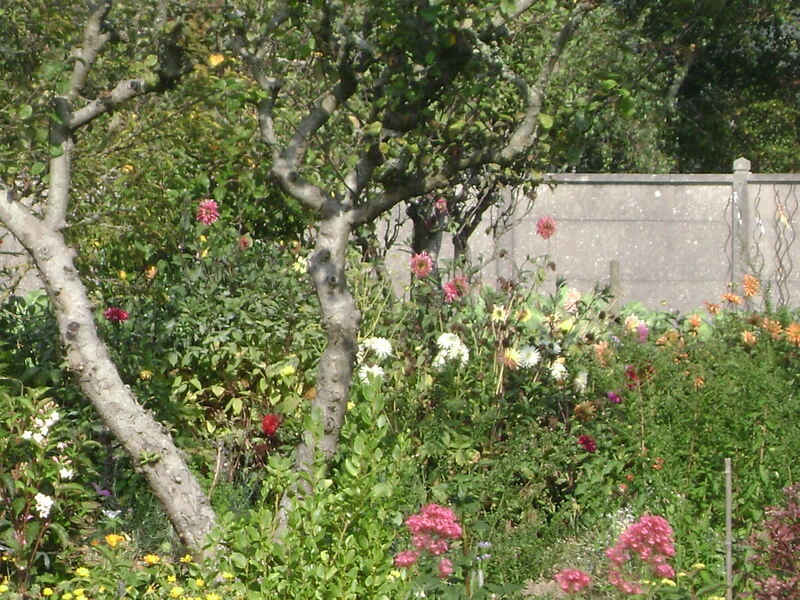 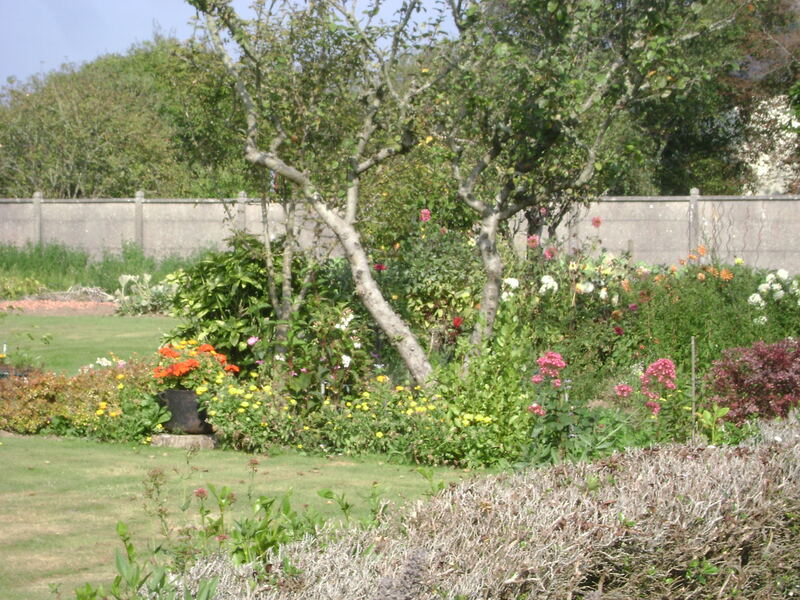 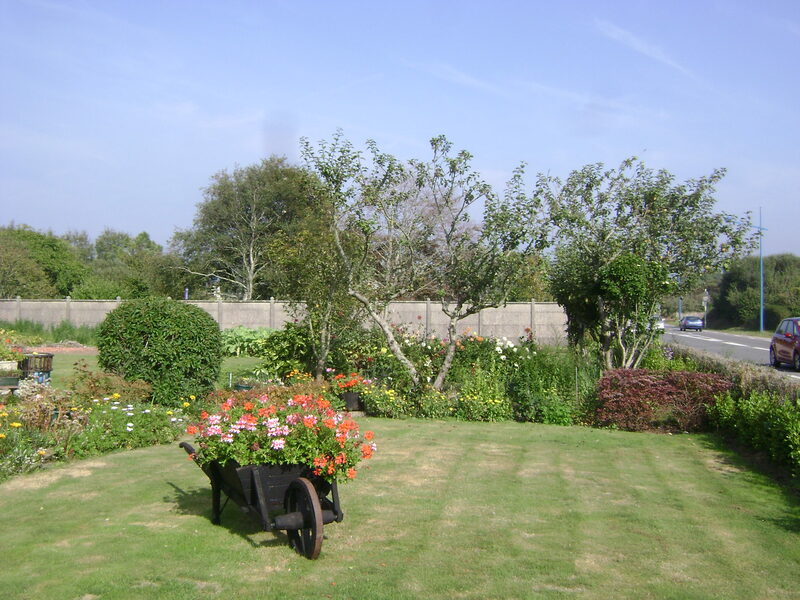 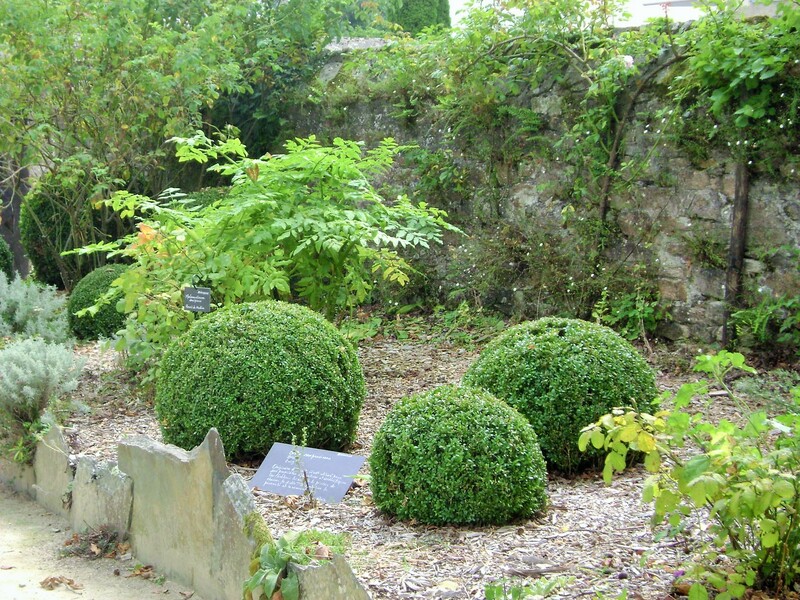 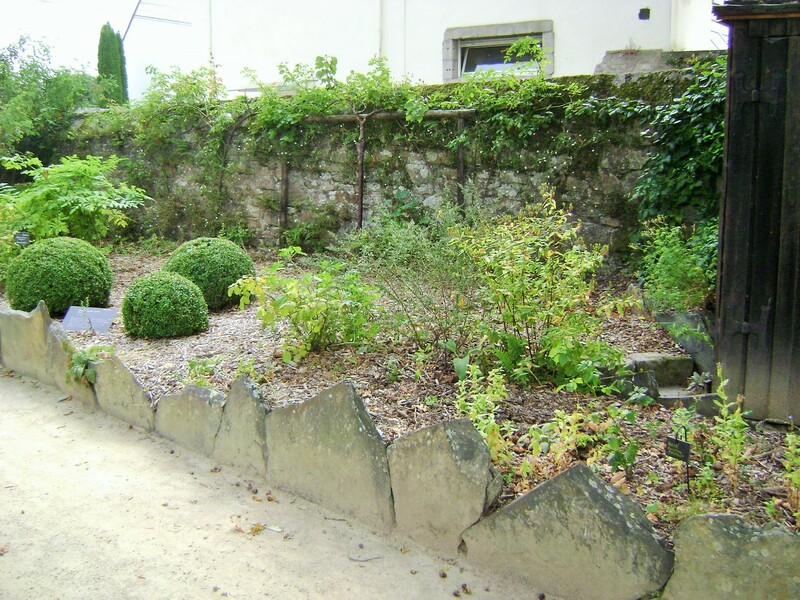 I have featured other such gardens in my posts as they are often found in Brittany villages and around France. 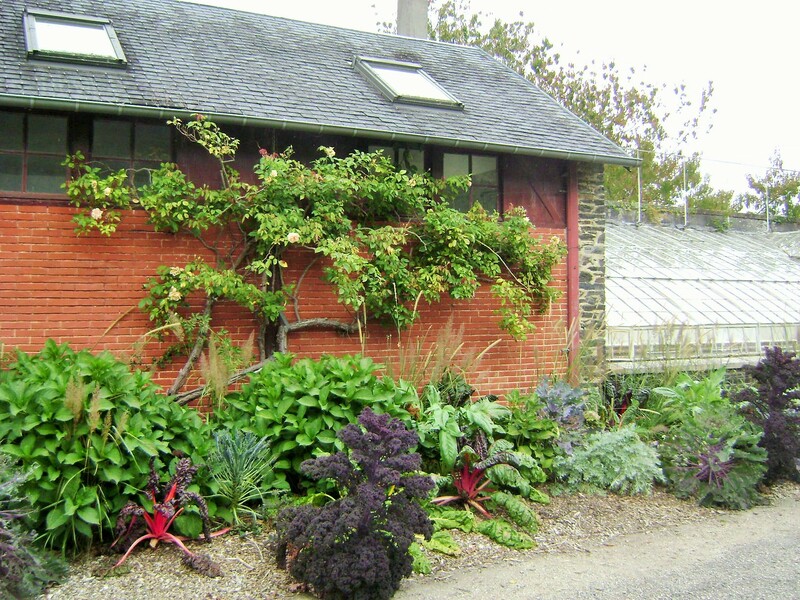 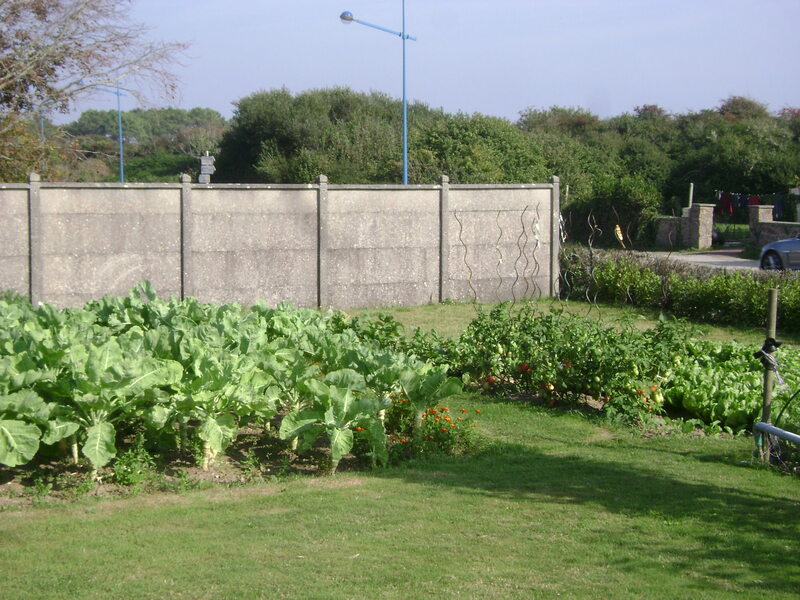 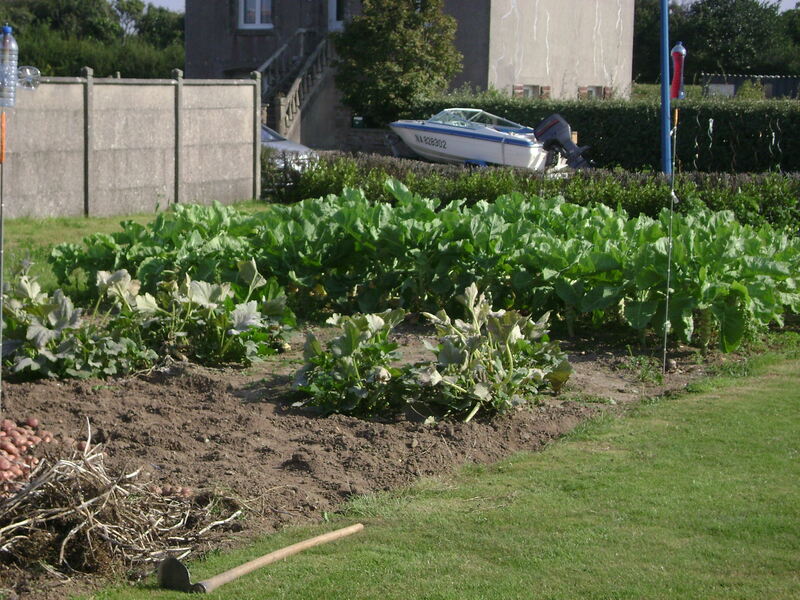 The side of the house is dedicated to a vegetable patch towards the back with rows of tomatos, salads, cabbage, pumpkins, squashes, gourds and potatoes. 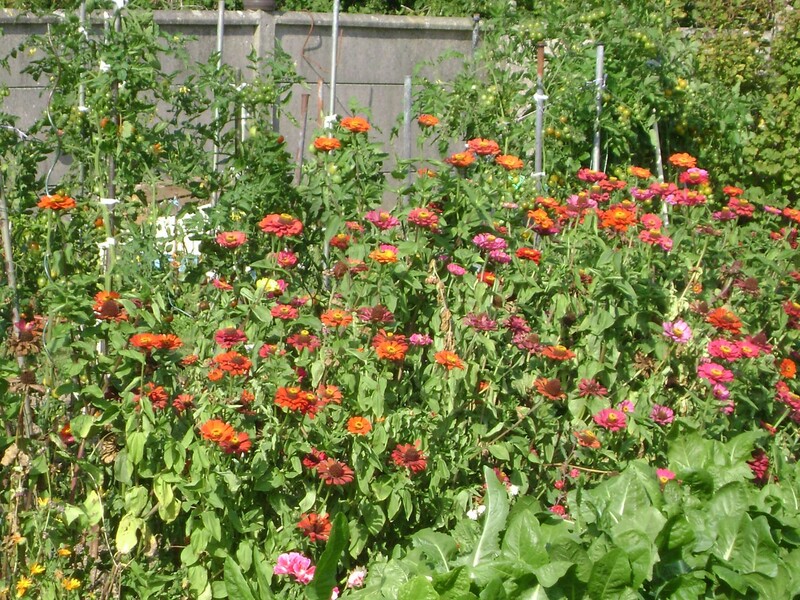 Flowers are mixed in to help pollination. 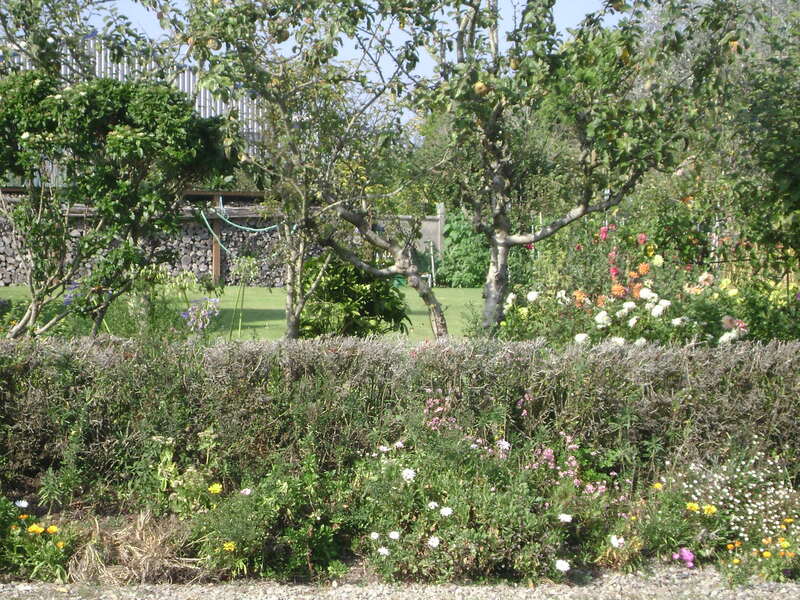 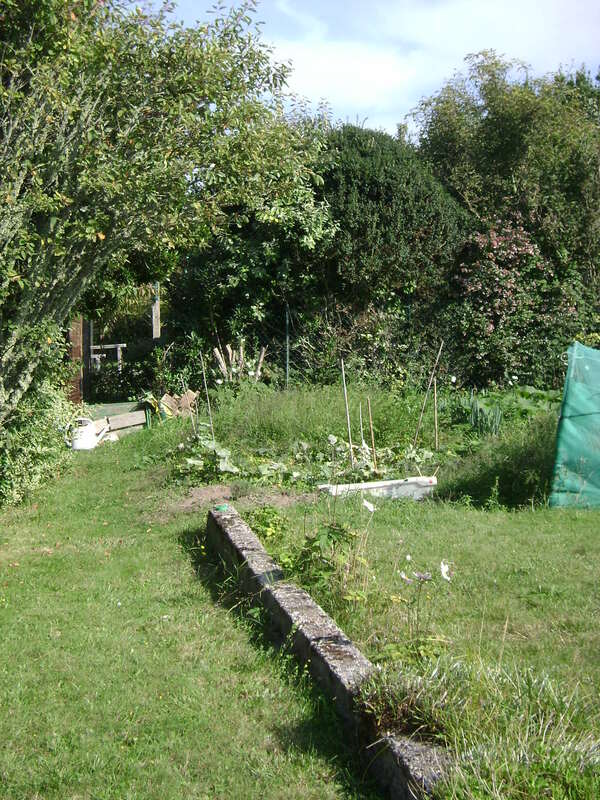 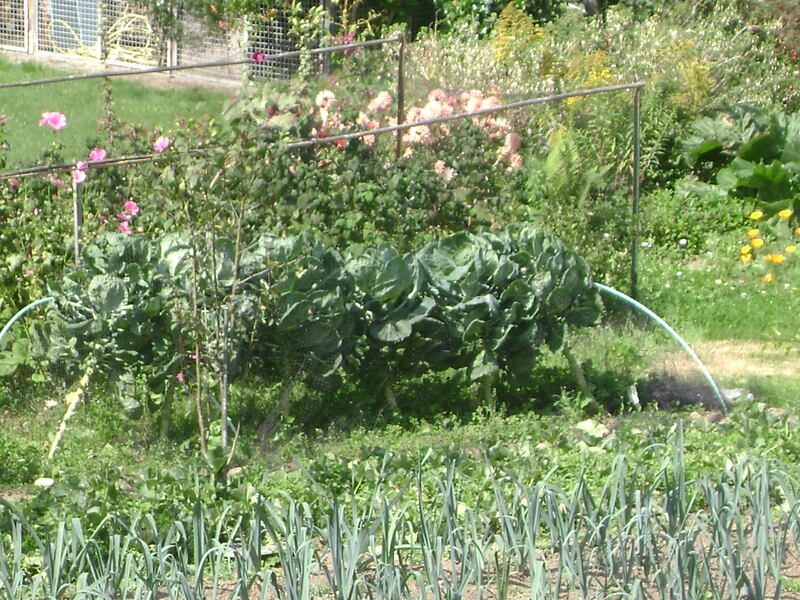 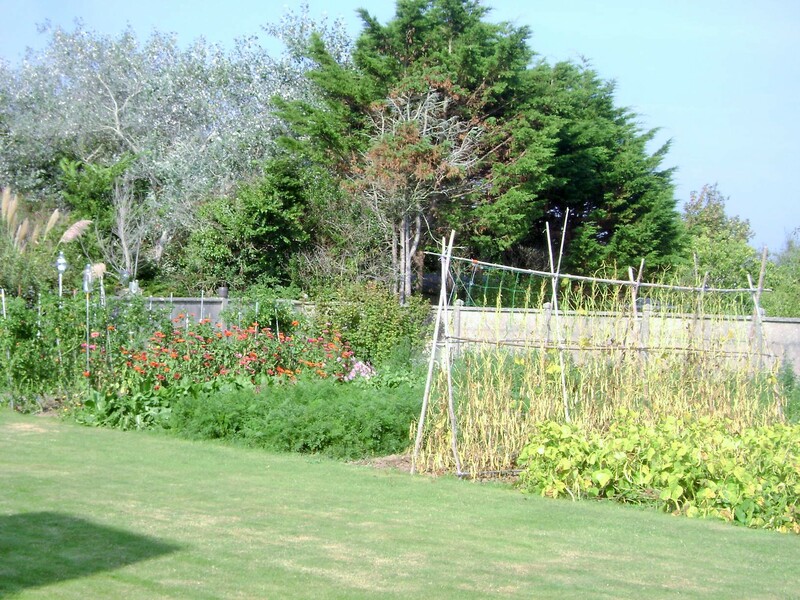 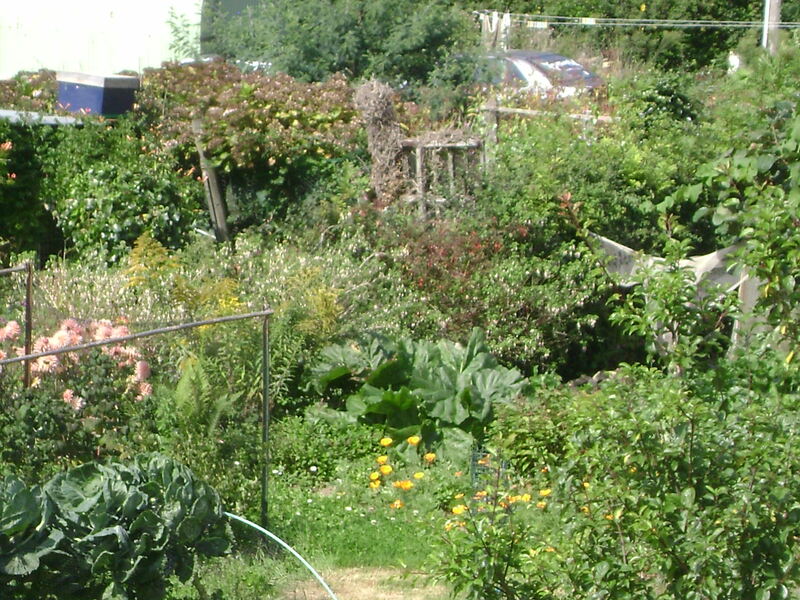 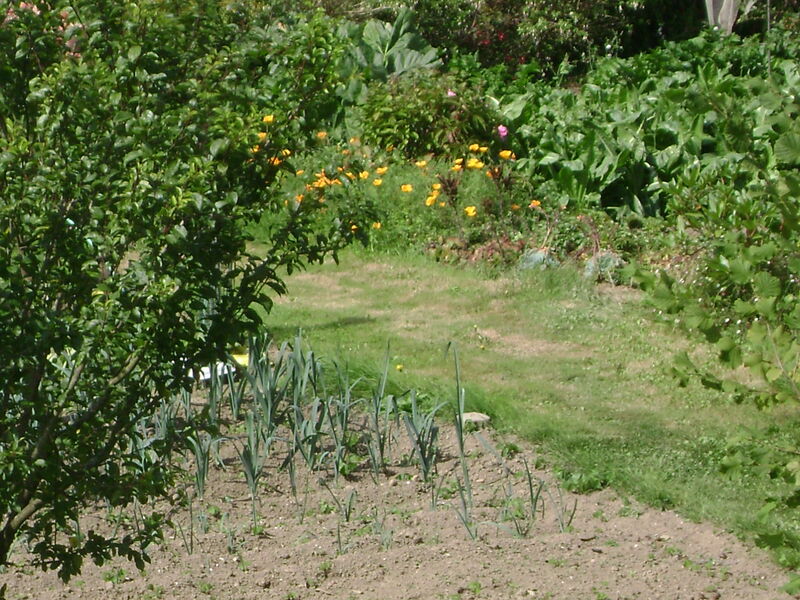 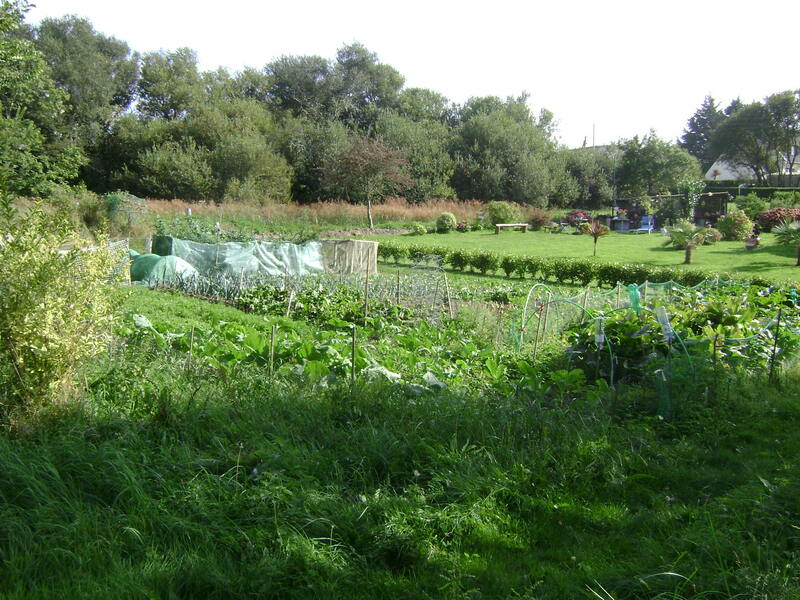 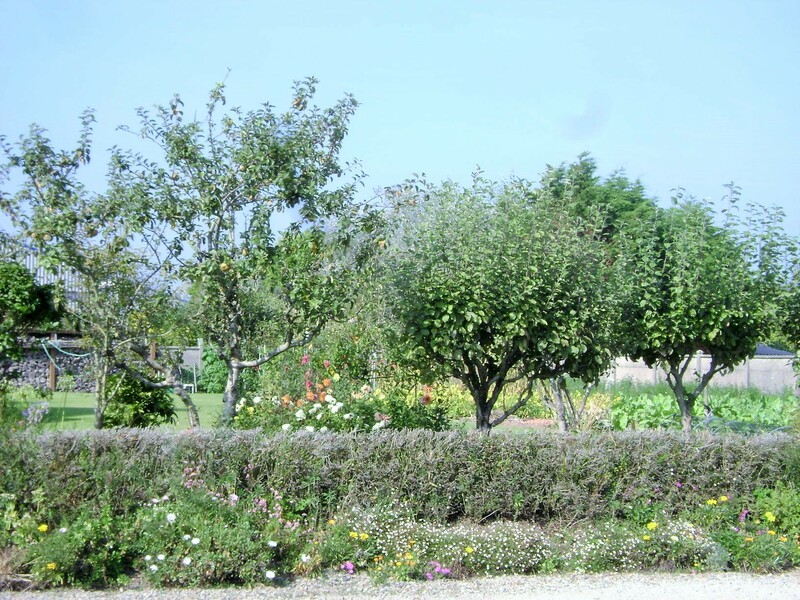 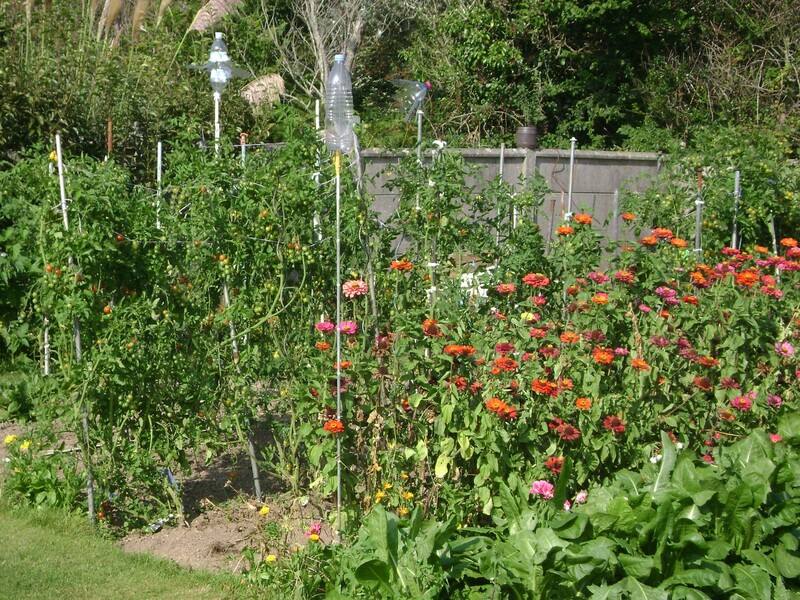 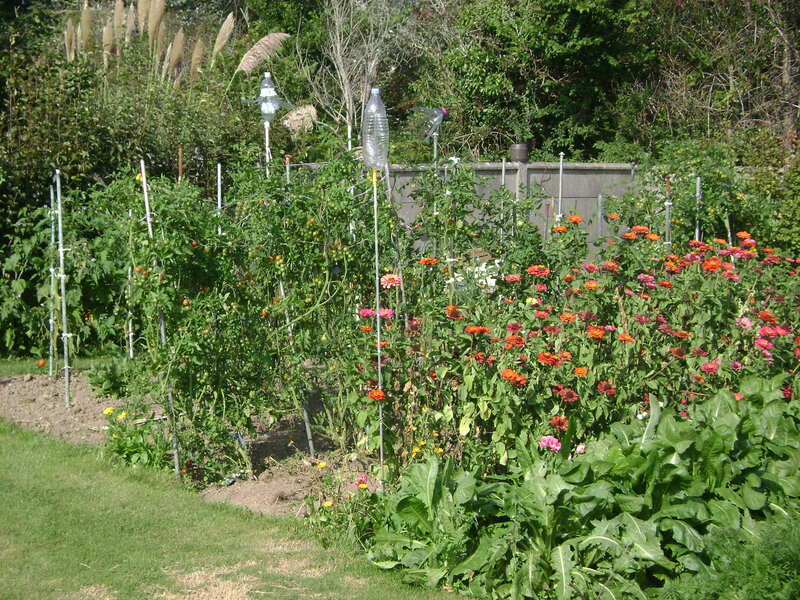 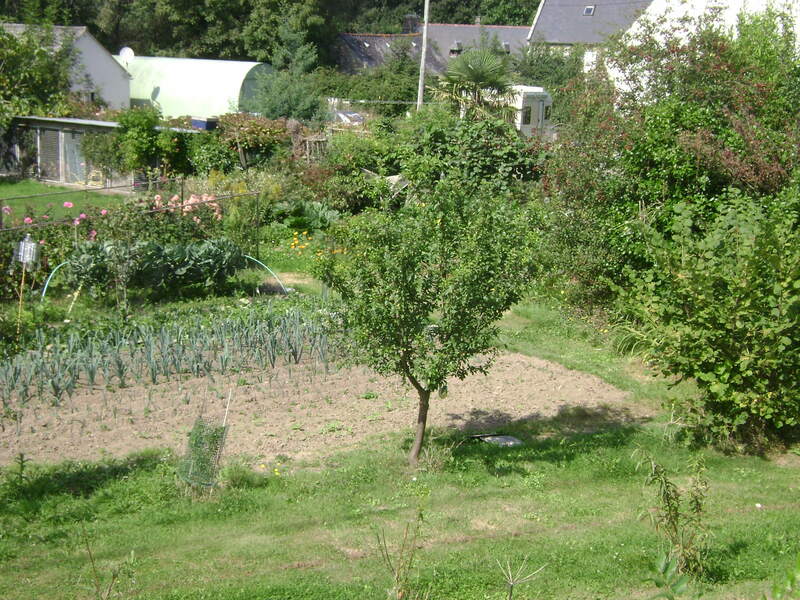 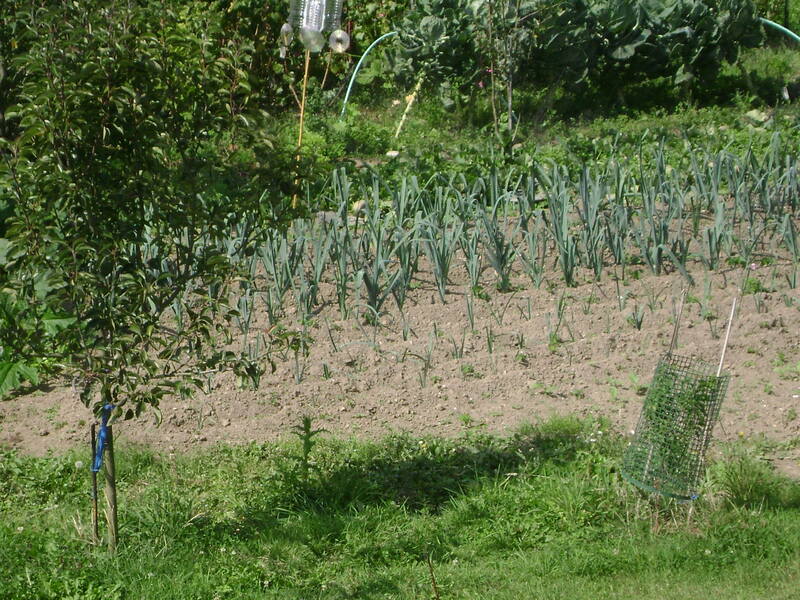 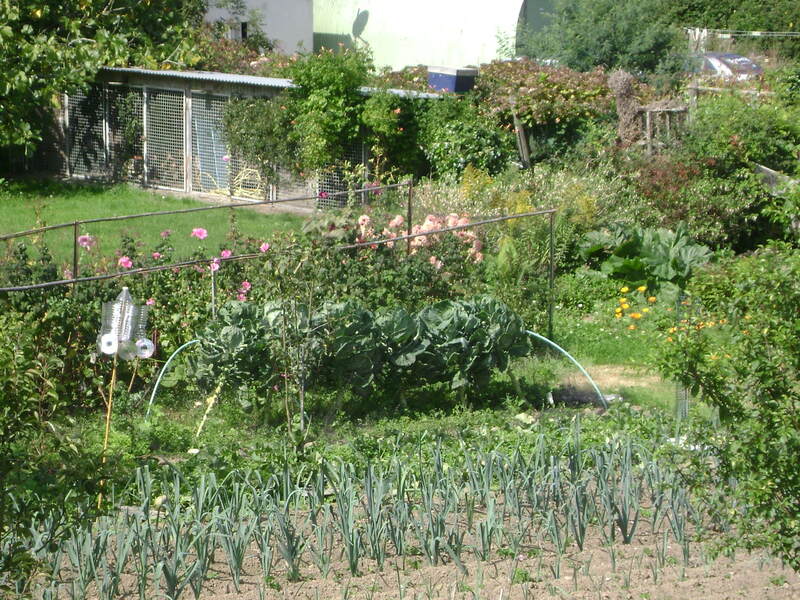 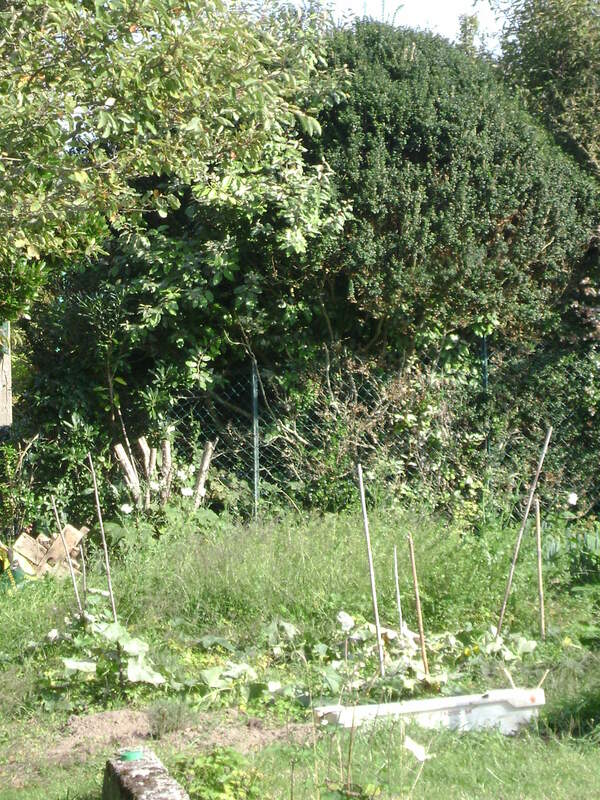 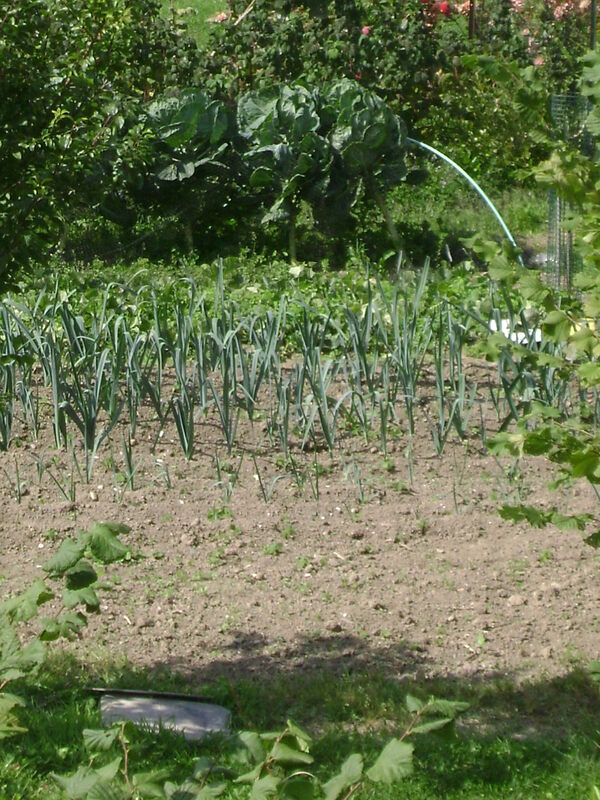 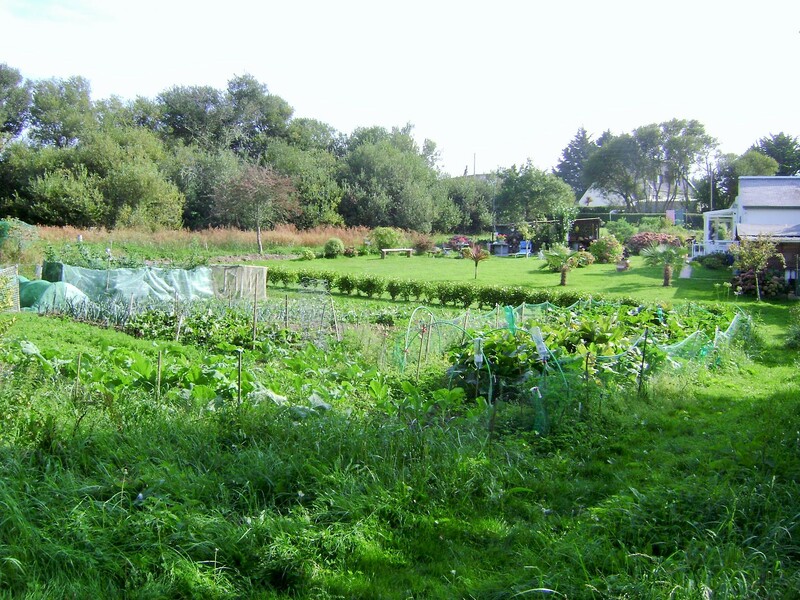 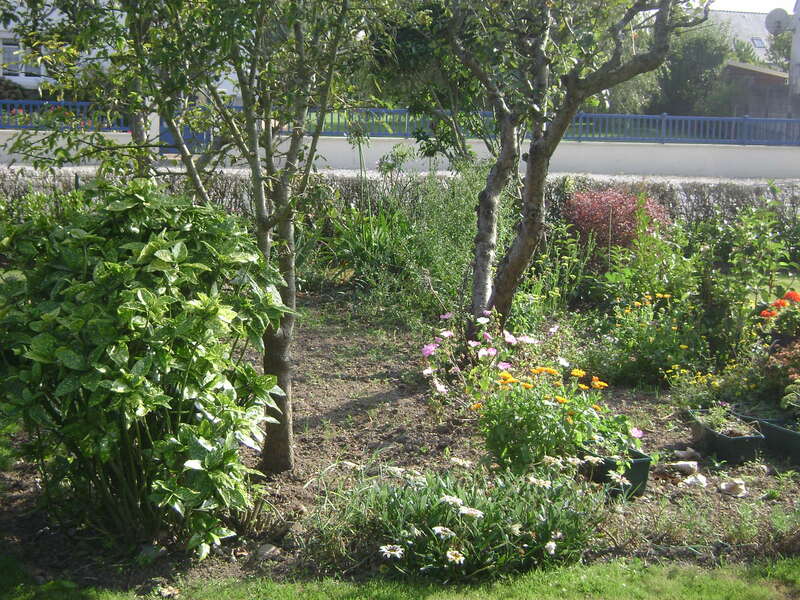 Towards the front are fruit trees and small vegetables. 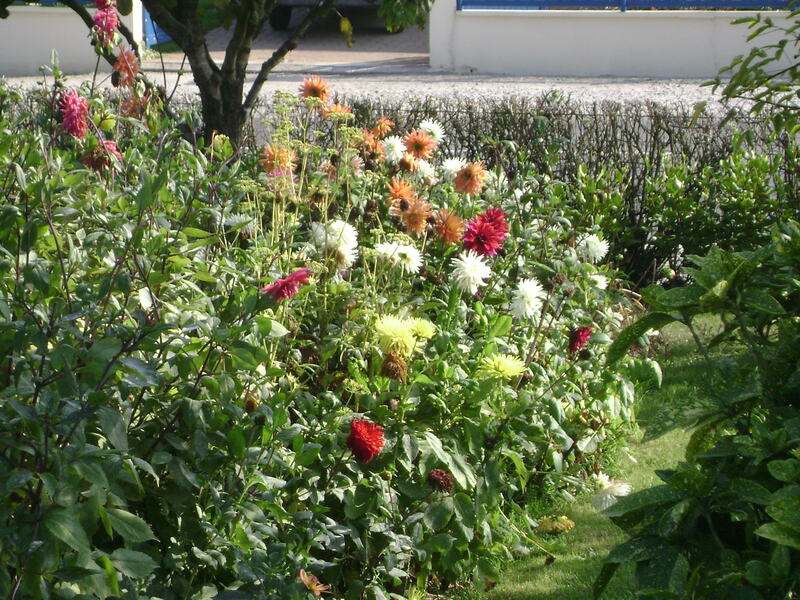 The front of the house is planted with a riot of color from assorted annuals, perennials and dahlias, while potted floweres and container arrangements surround the front door and line the path. 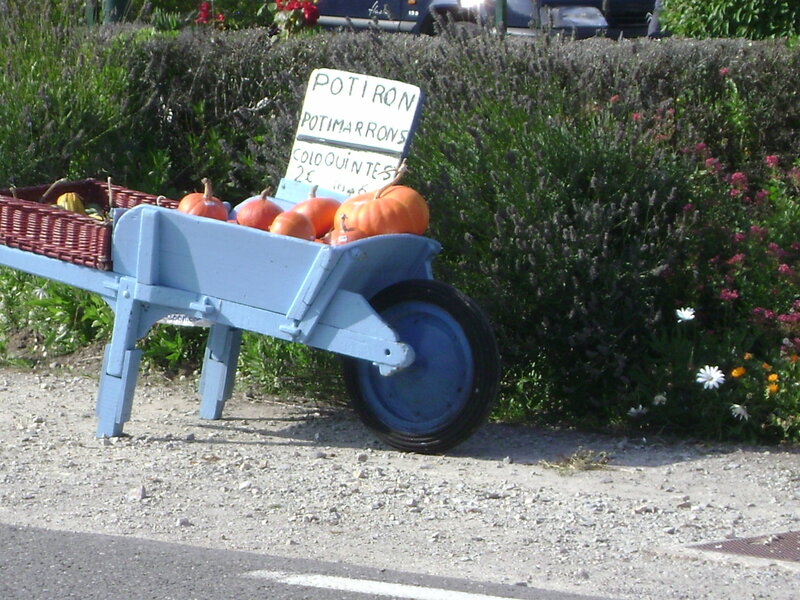 Extra gourds and pumpkins go into a wheelbarrow by the gate. 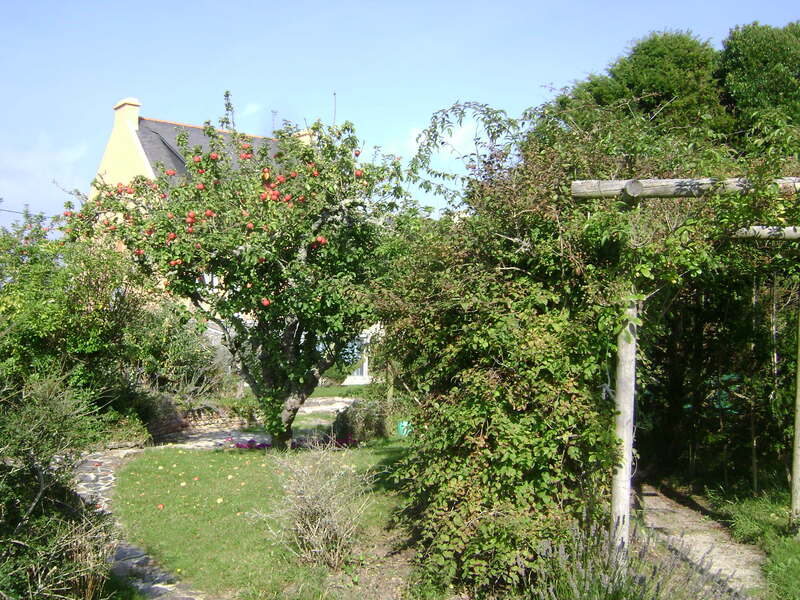 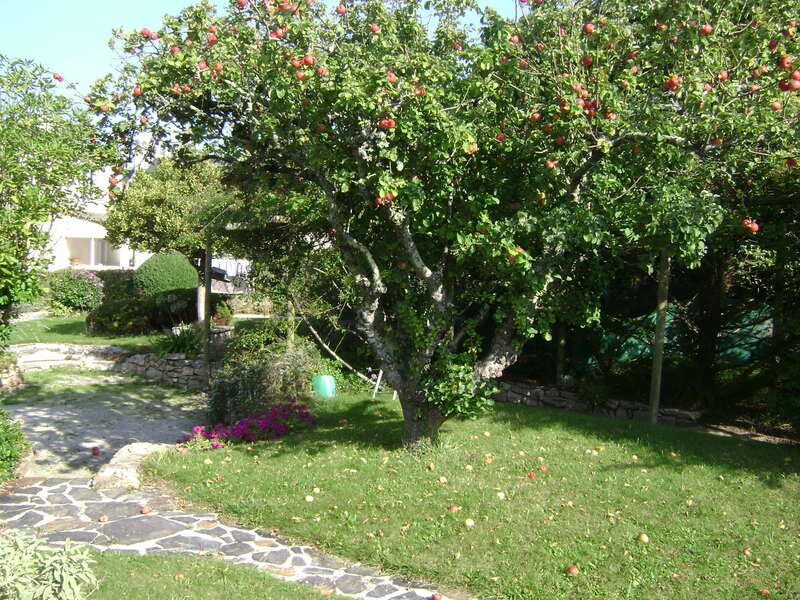 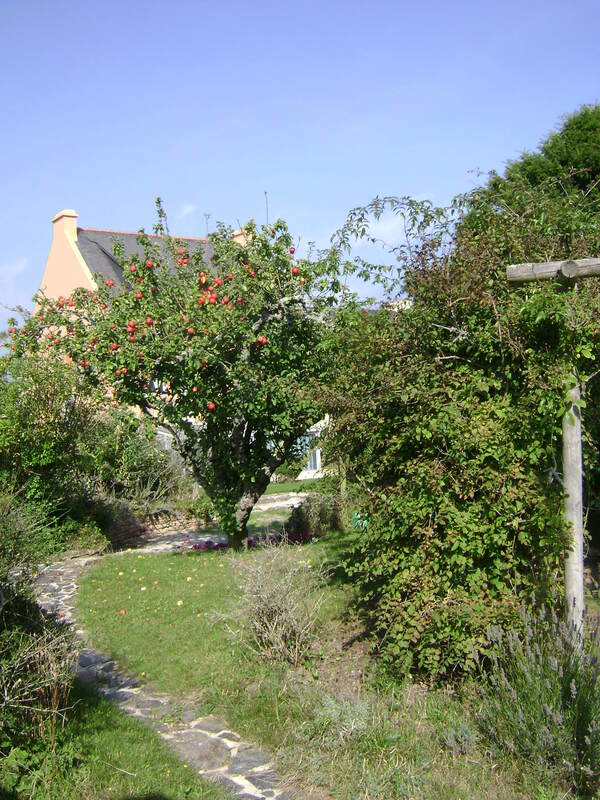 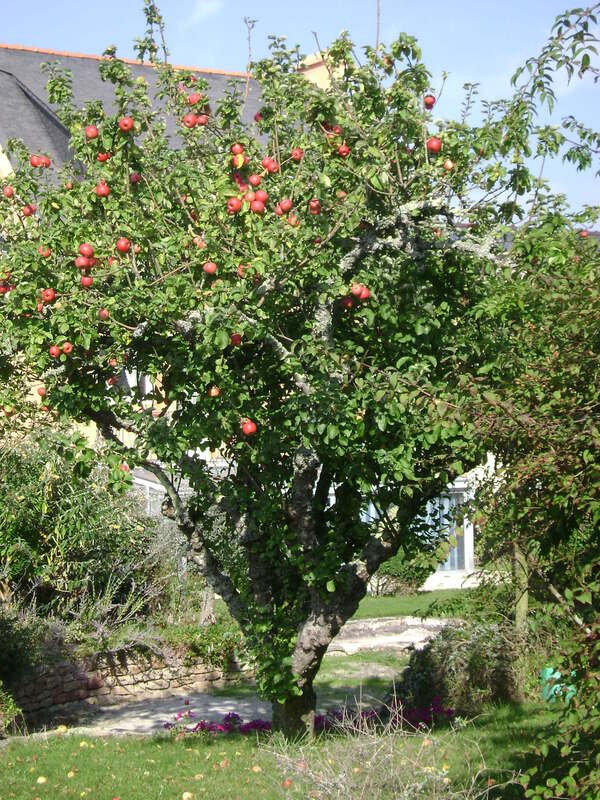 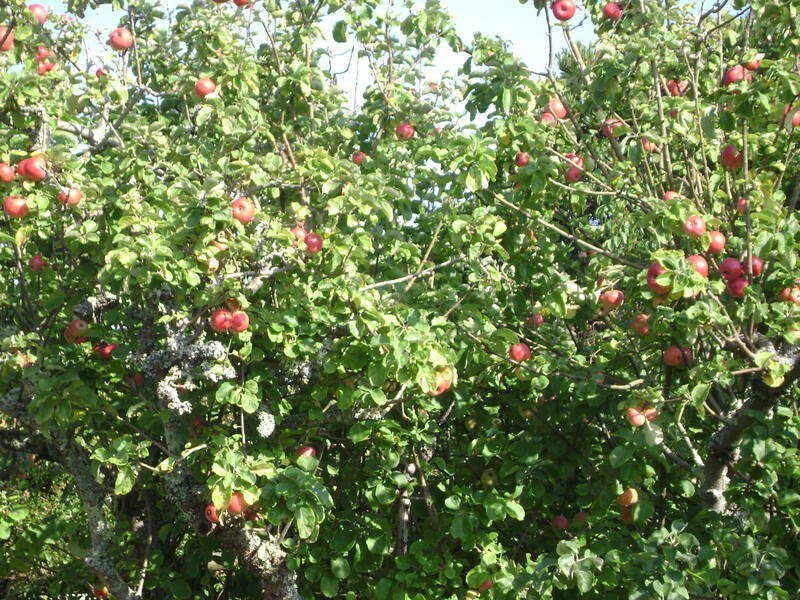 Much like the Normandy region, Brittany, France is known for its apples. 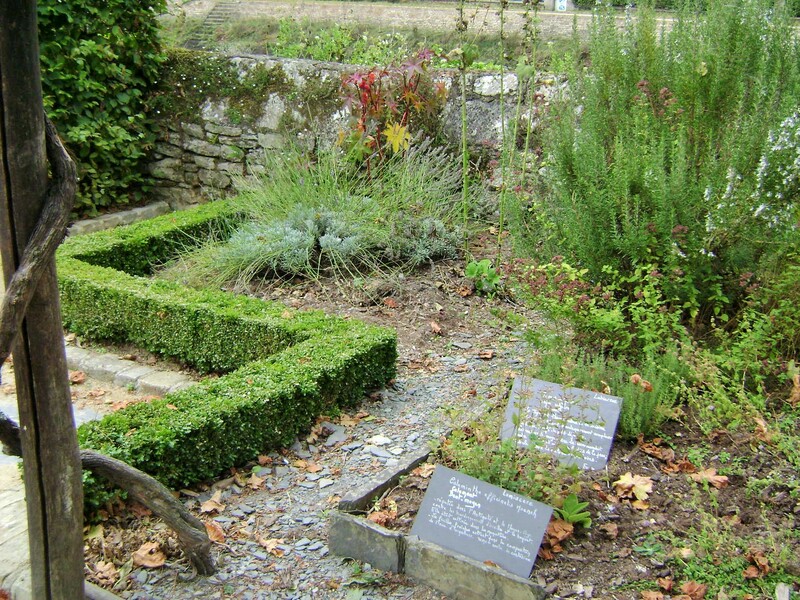 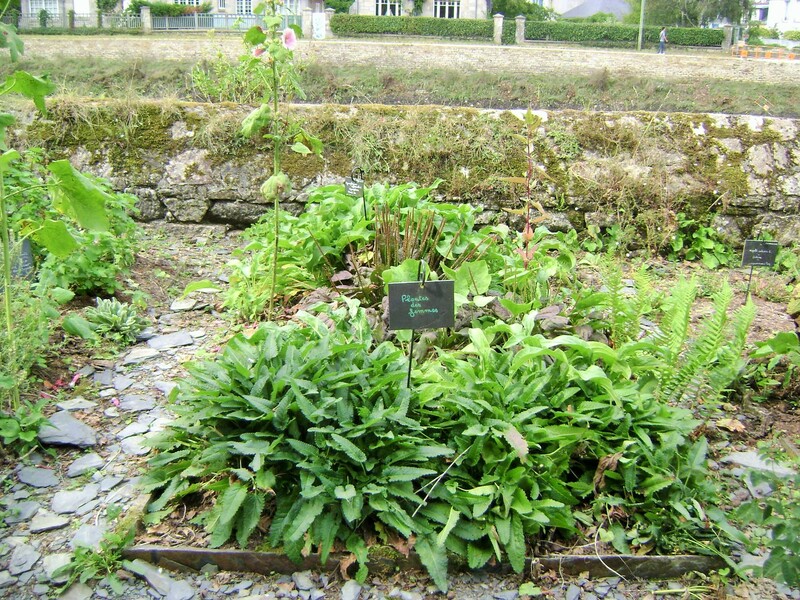 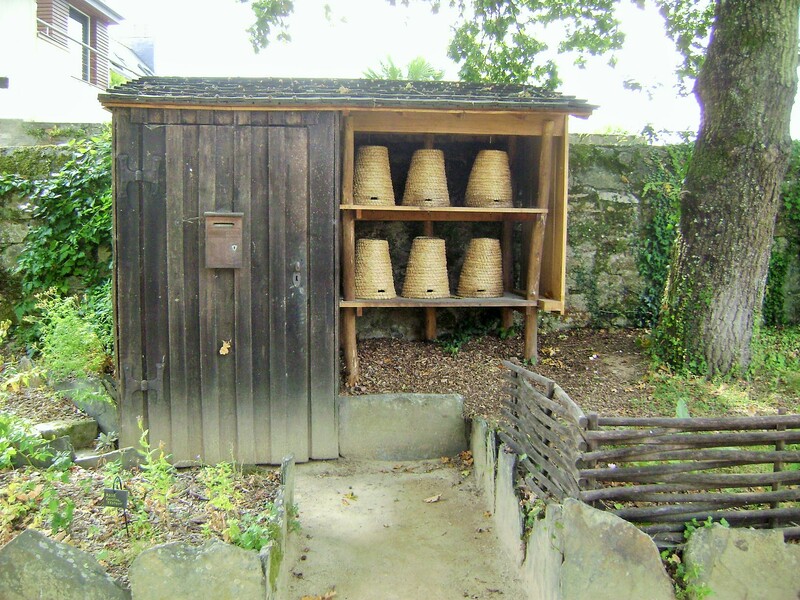 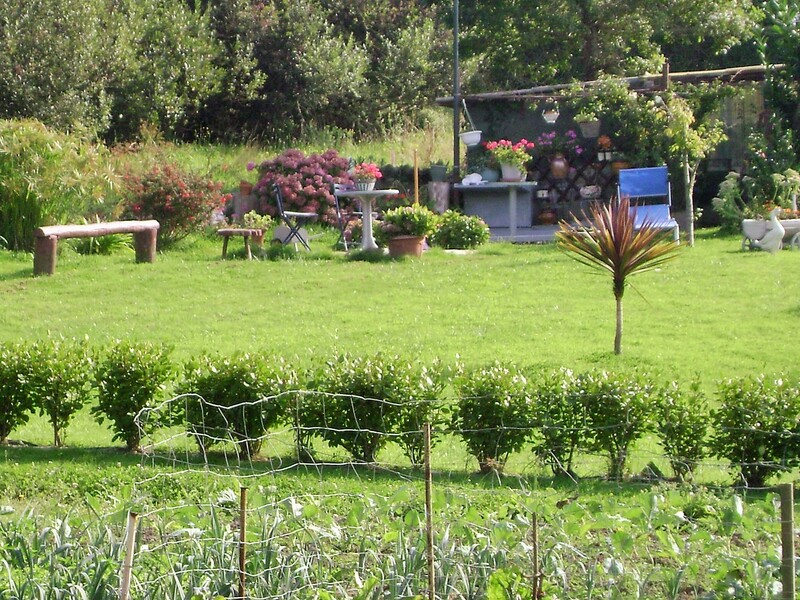 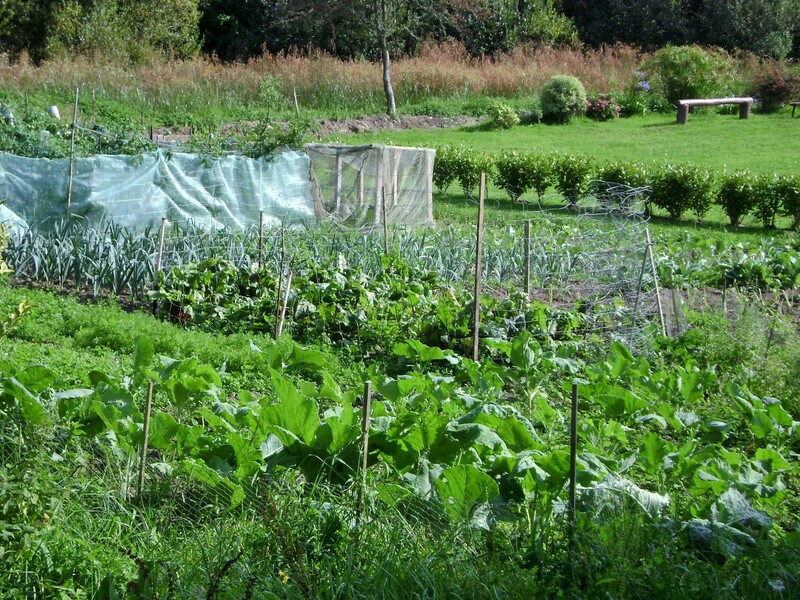 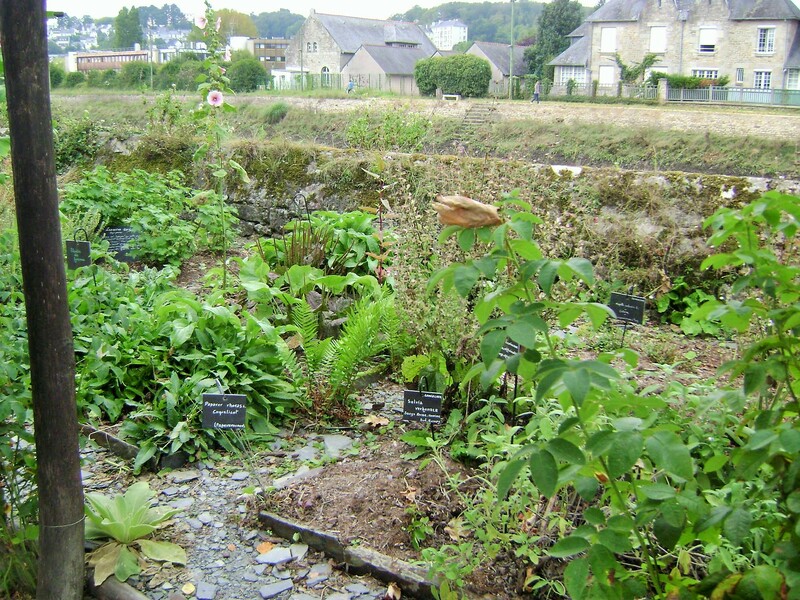 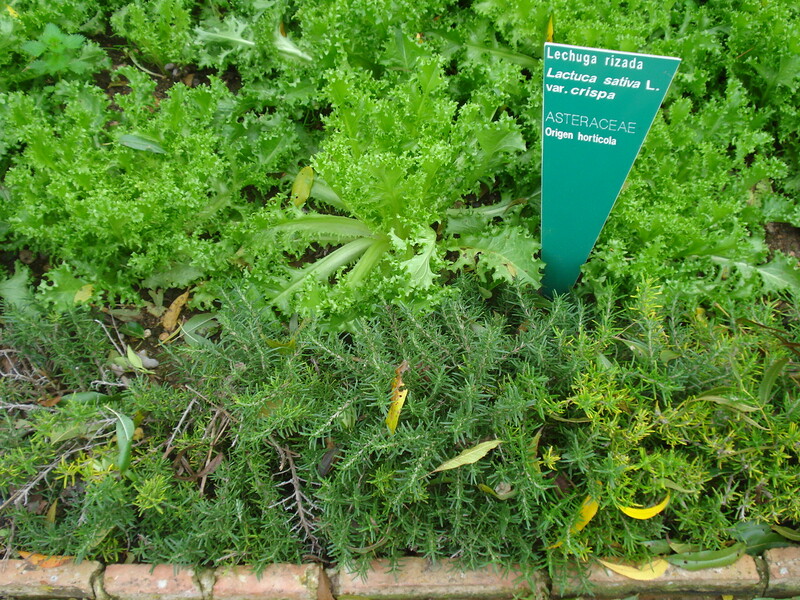 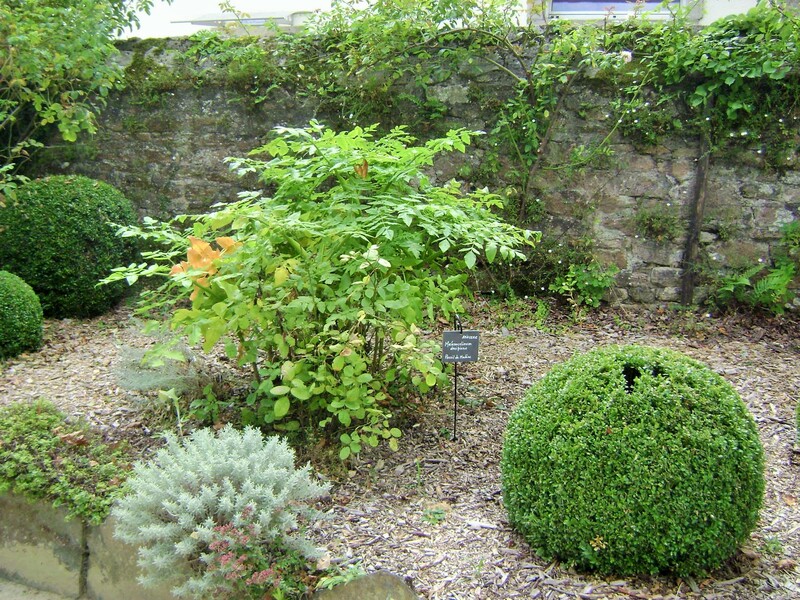 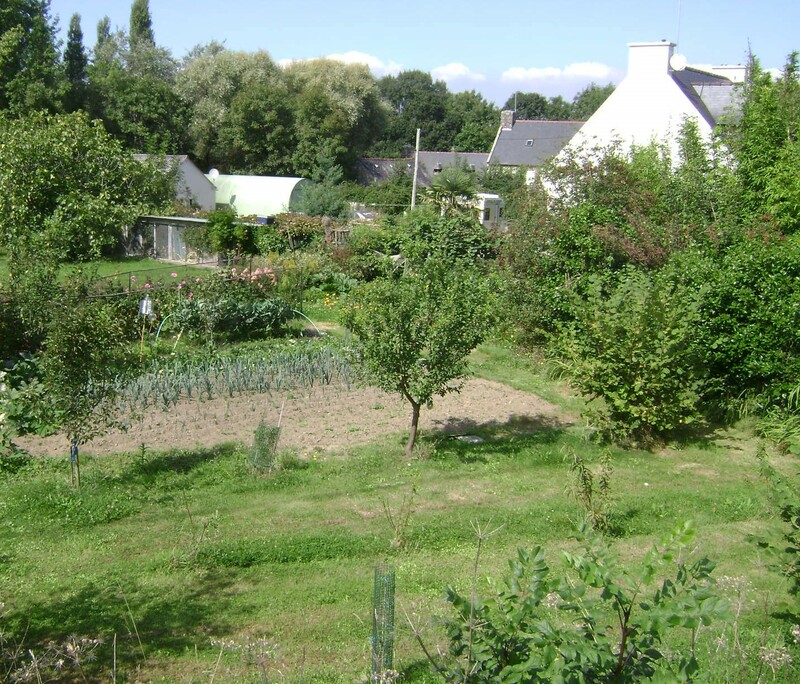 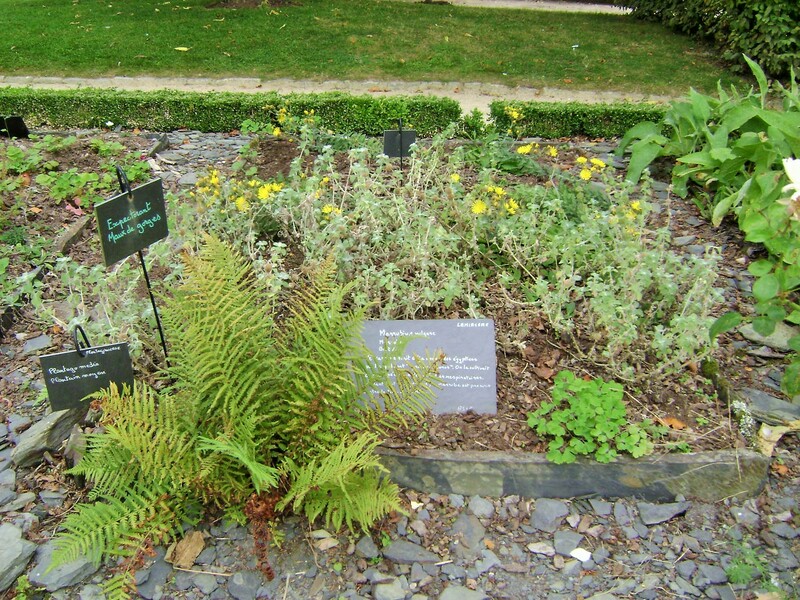 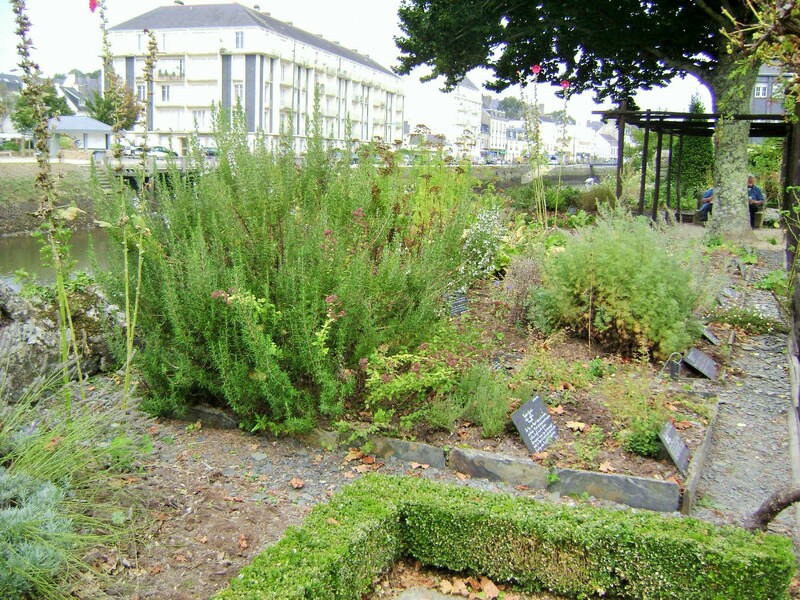 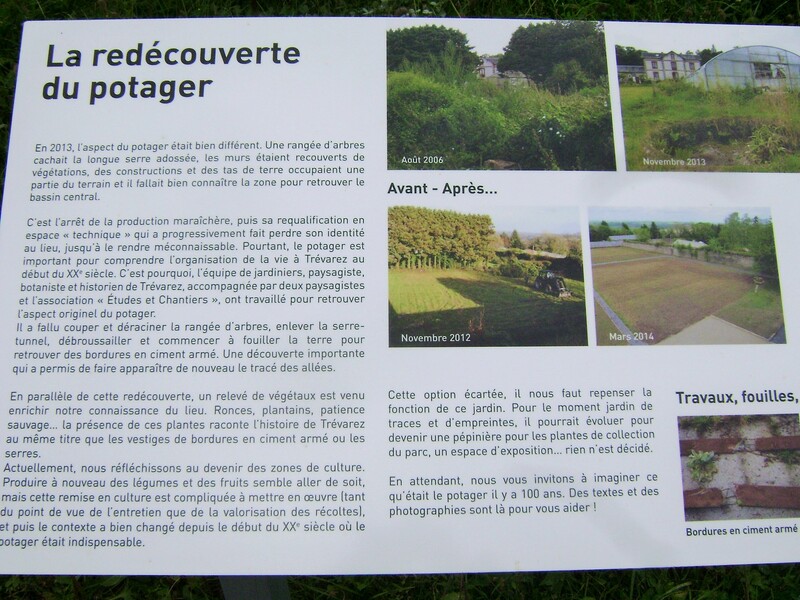 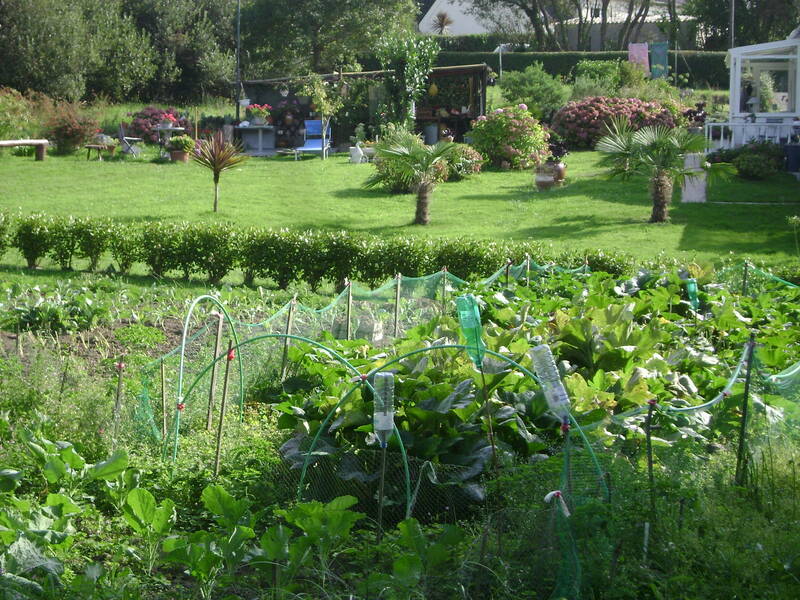 Countless varieties are grown in every garden of Brittany. 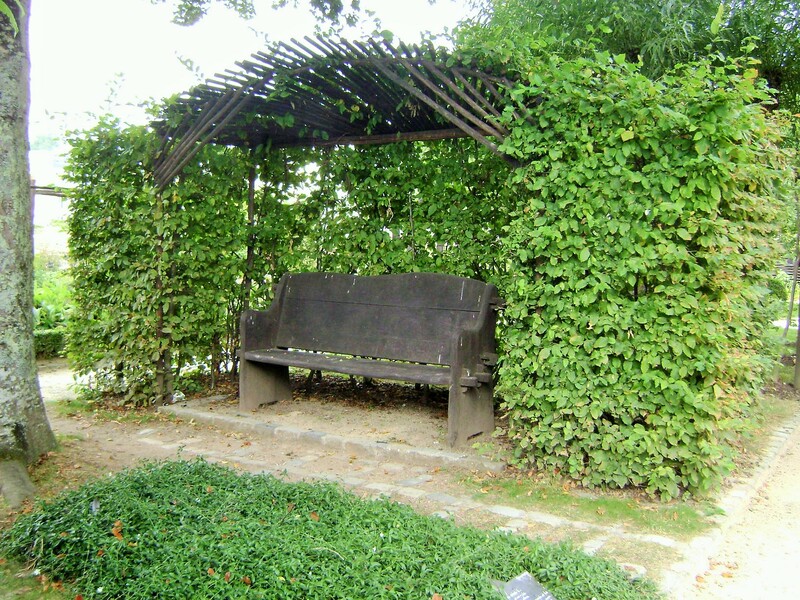 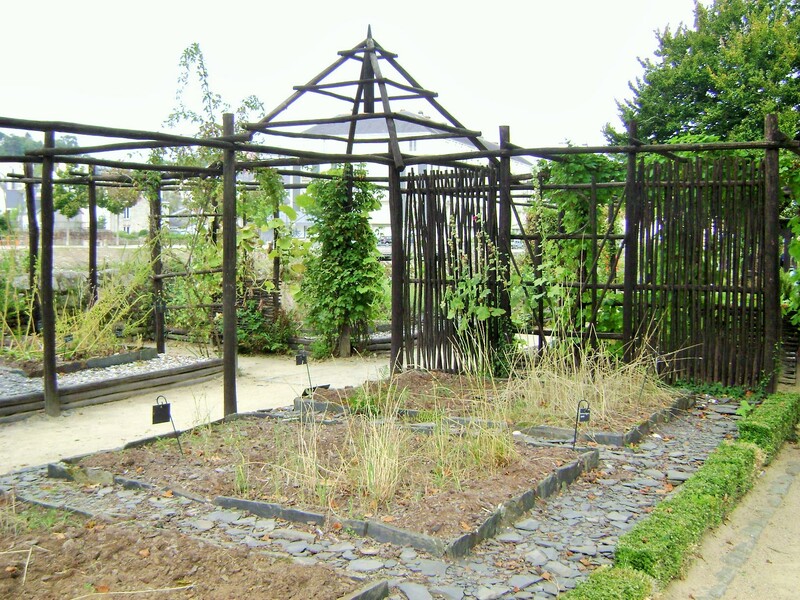 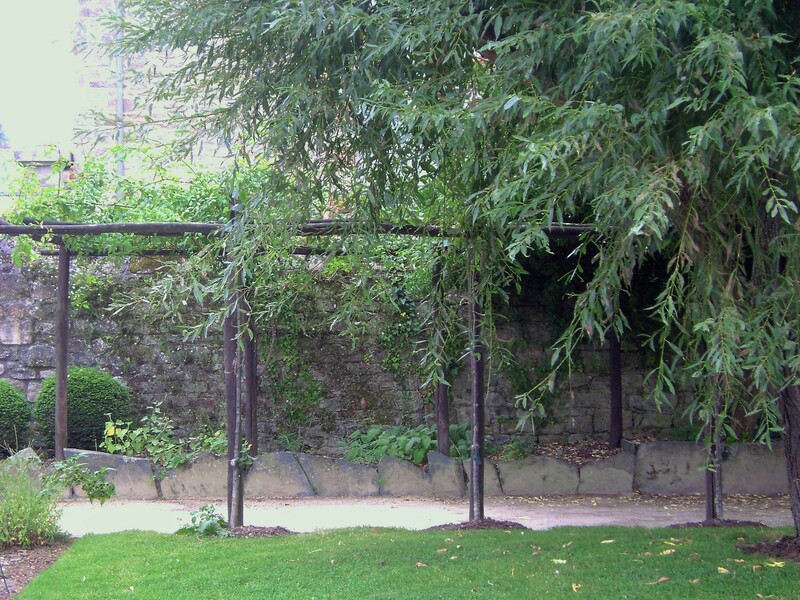 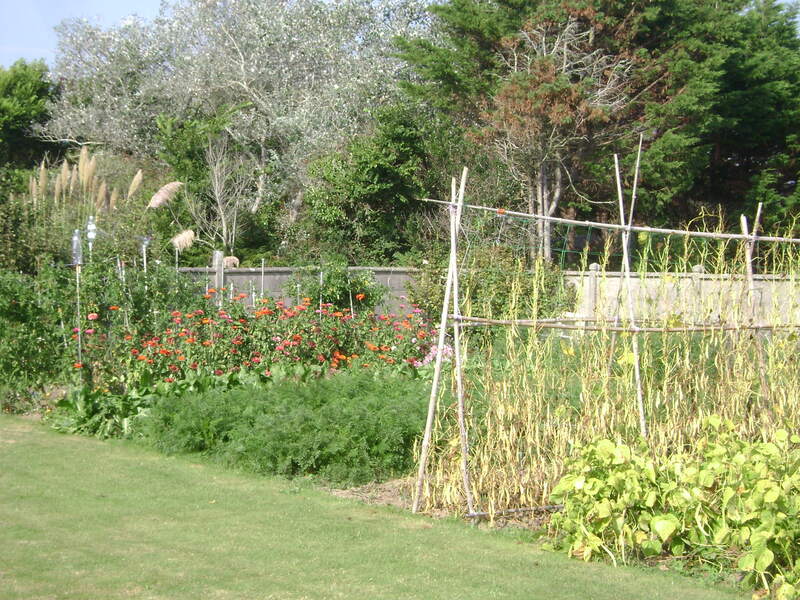 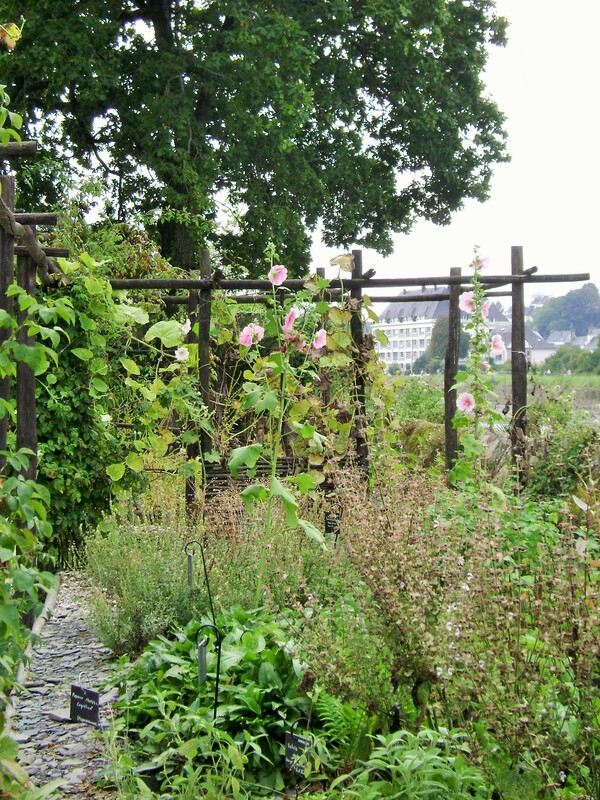 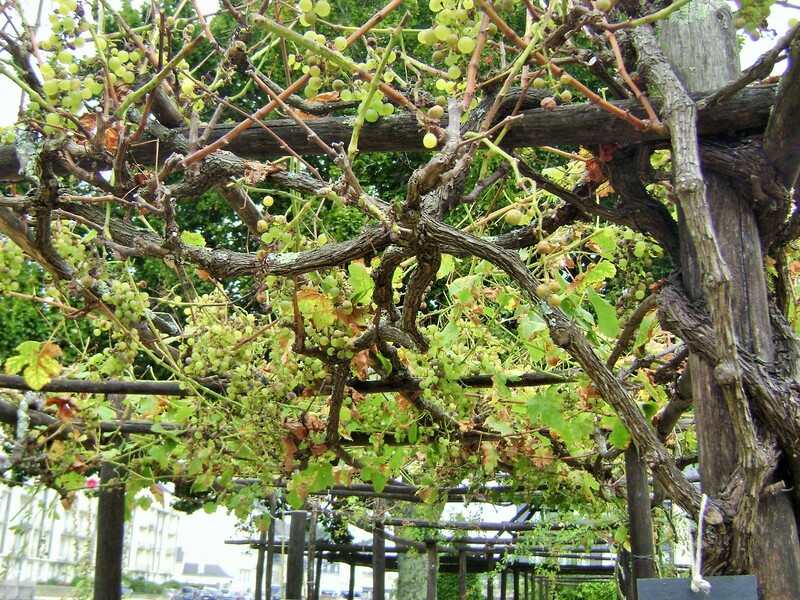 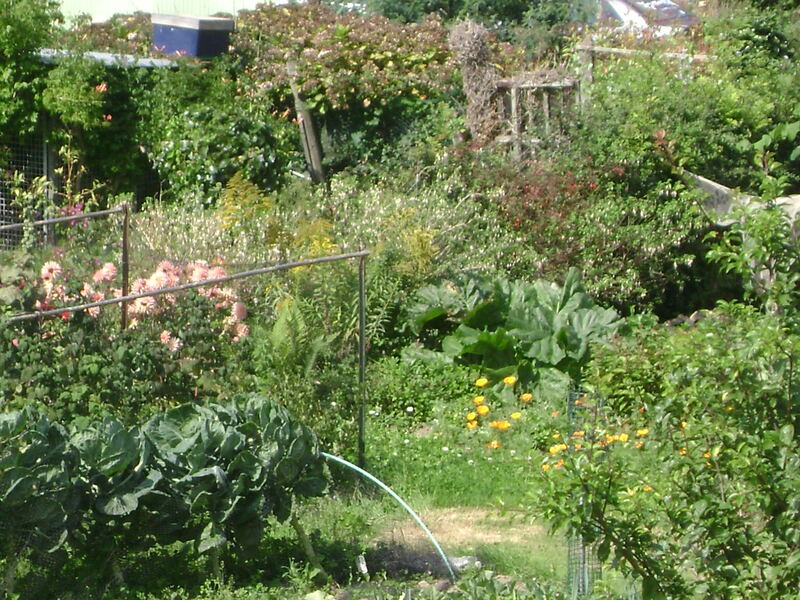 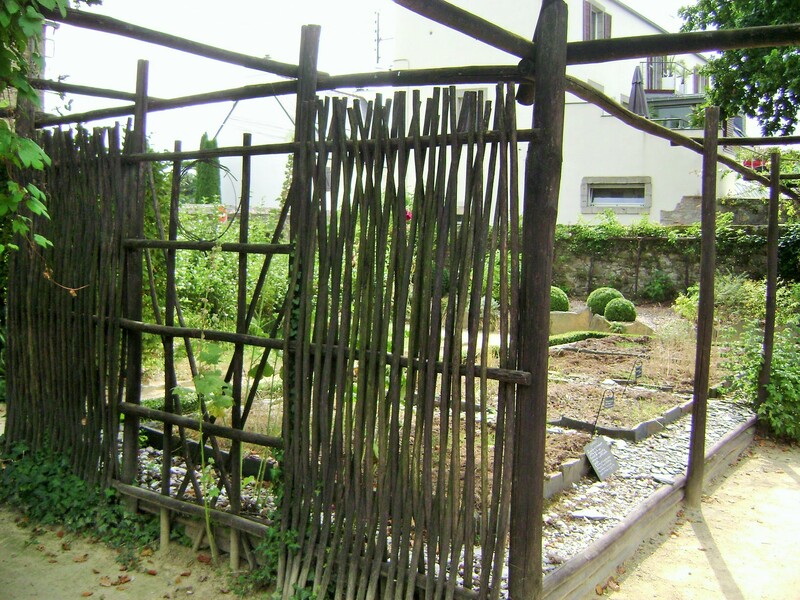 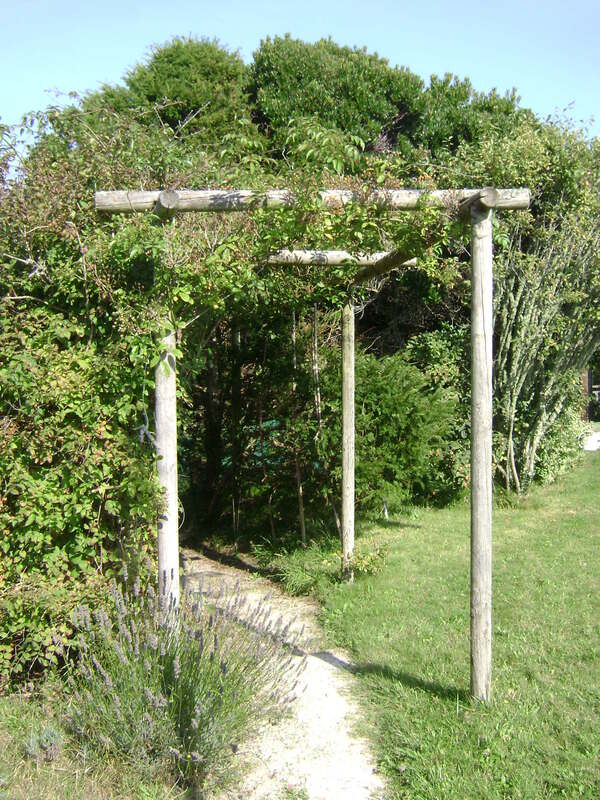 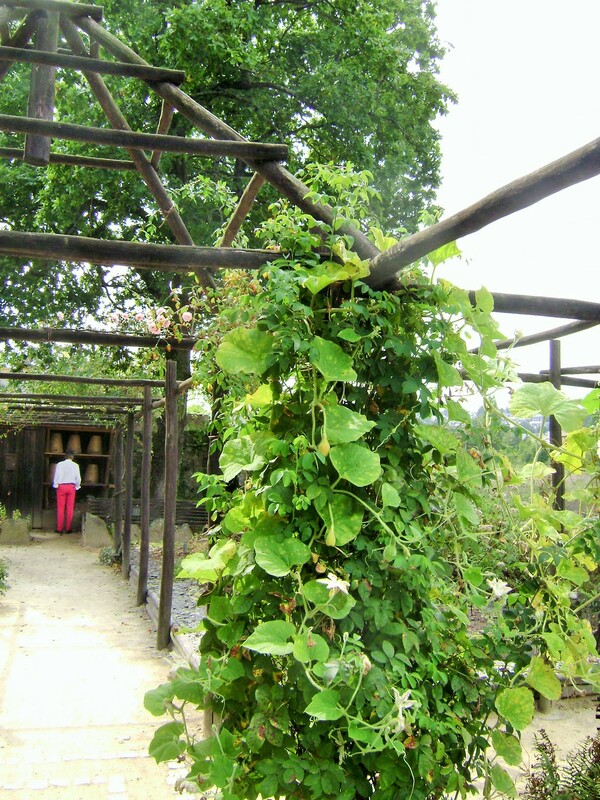 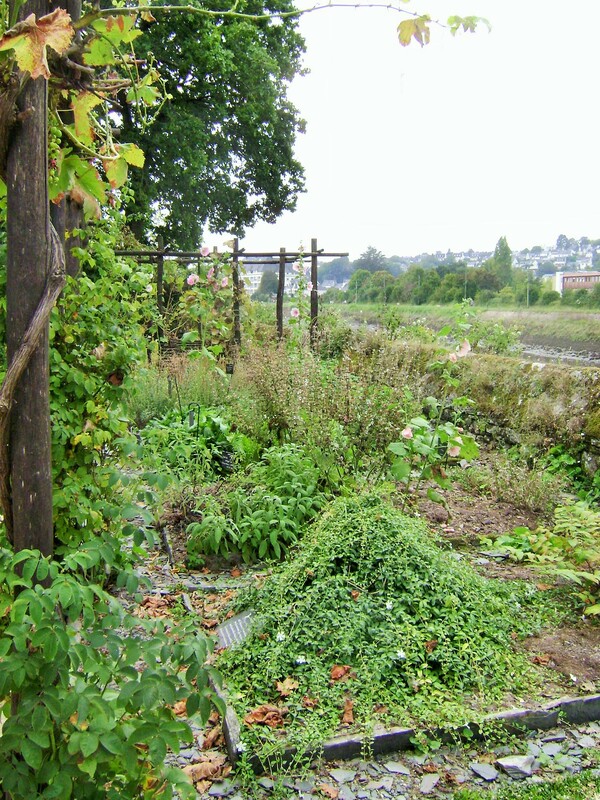 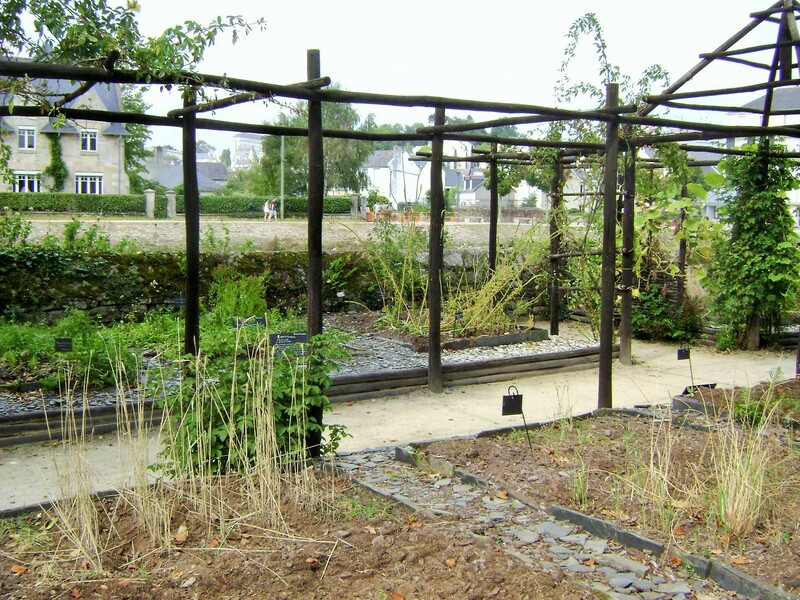 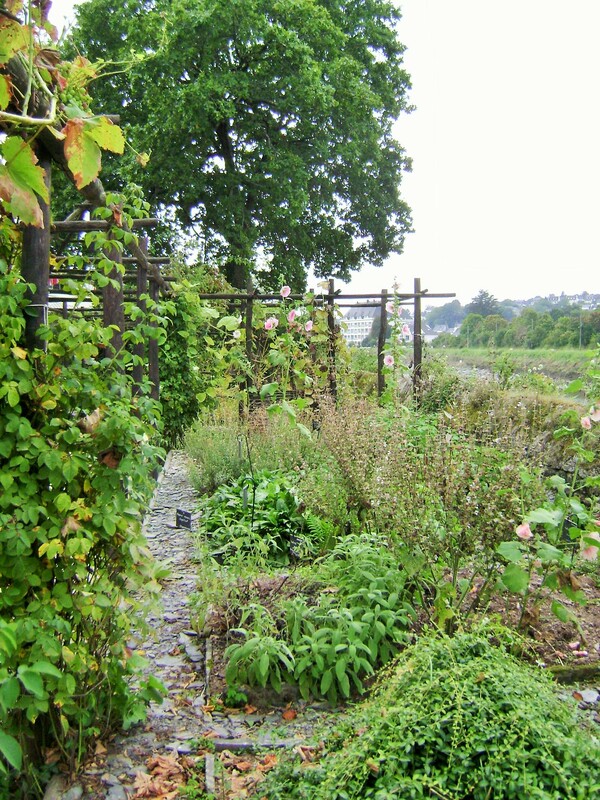 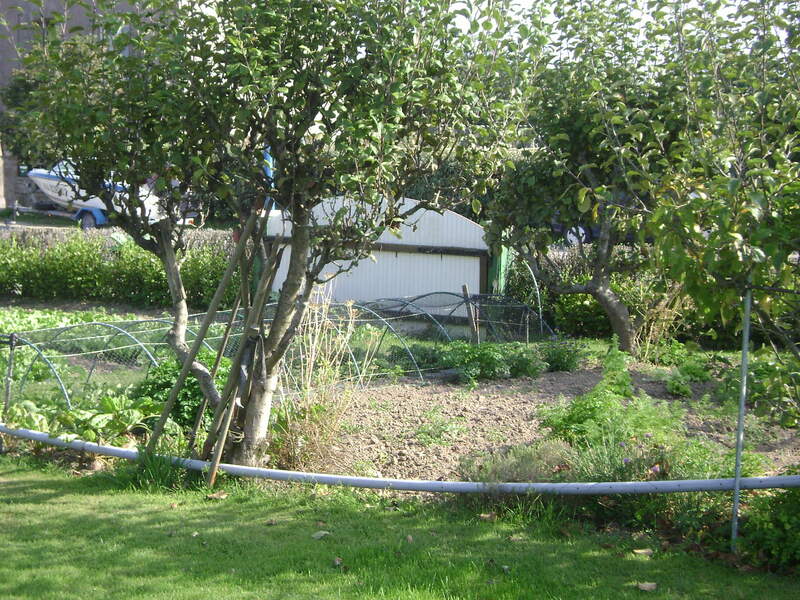 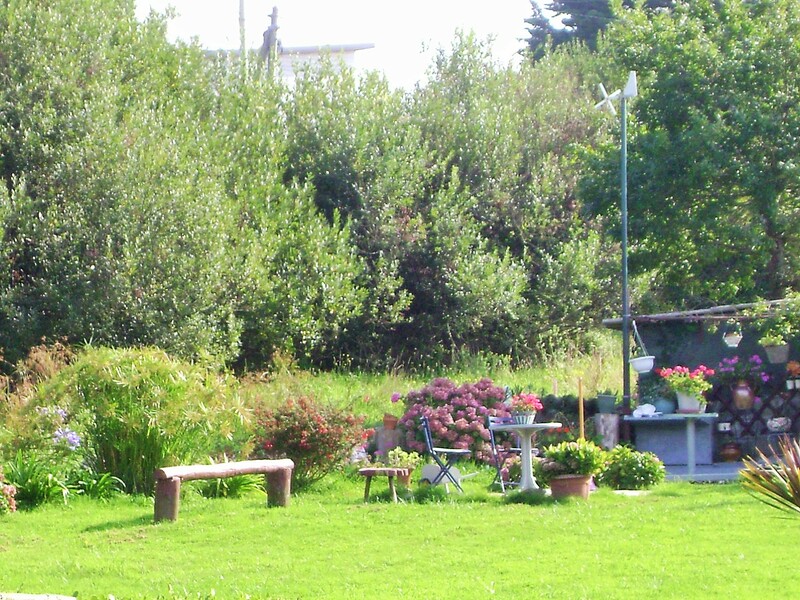 This garden divided a small orchard from a vegetable garden area with a rustic wood arbor covered in vines. 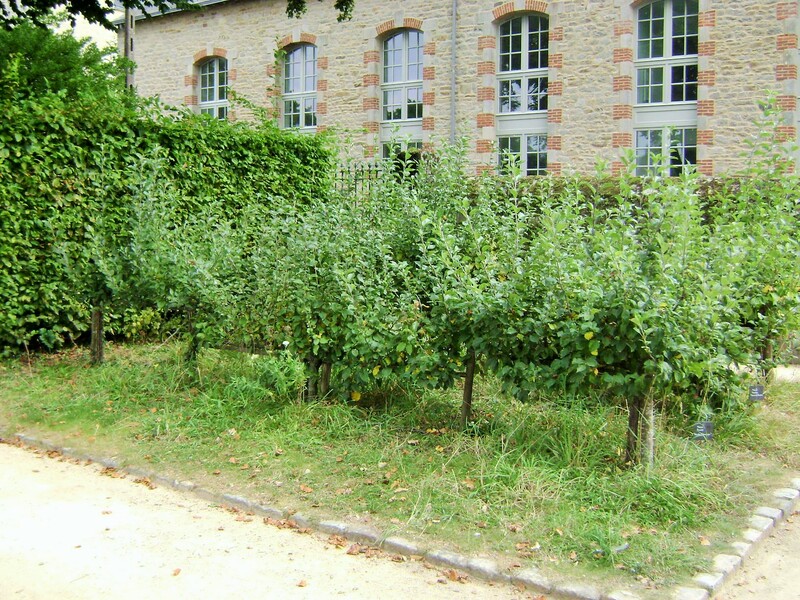 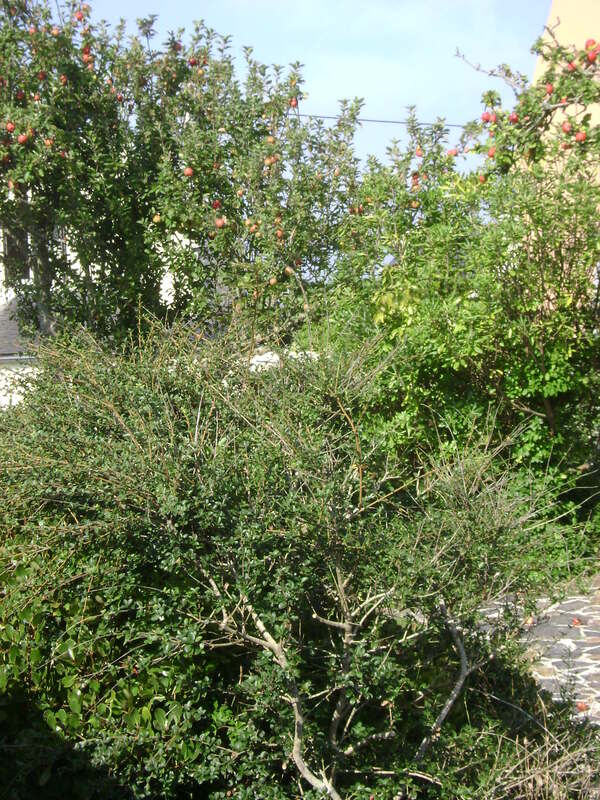 There is also a row of espaliered fruit trees hedging the side of the property.